What are Santa’s reindeer like? We know Rudolph, Dasher, Dancer, Prancer, Vixen and the other reindeer pulling Santa’s Important Sleigh by name, but really nothing else. I went to find out what Santa’s reindeers are really like. 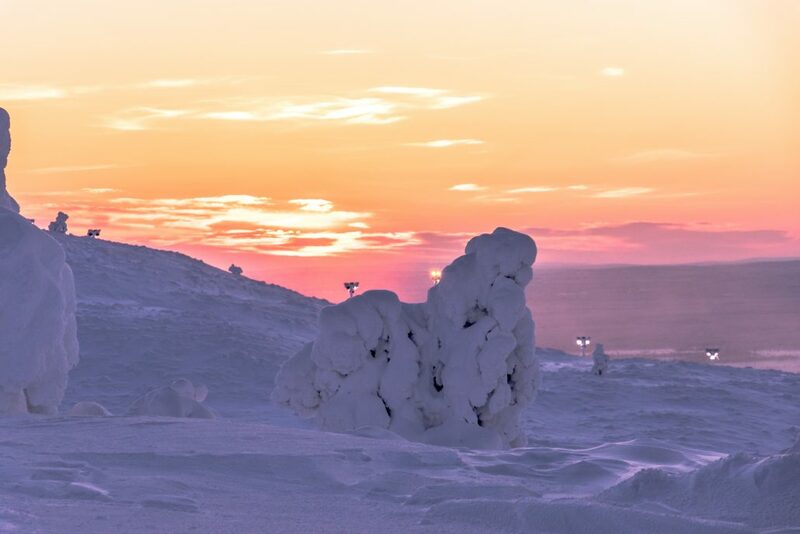 They live all around Lapland, some in Torassieppi, Muonio. 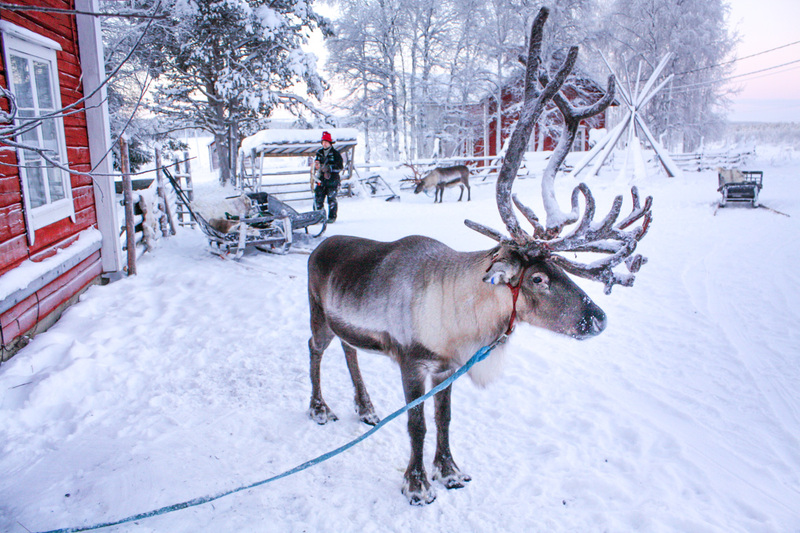 Meet Rolle, one of Santa’s less famous reindeer. The antlers are pretty impressive! Rolle is always willing to work hard and he is very patient with humans (and elves). He stood still for the photo shoot like a real pro model. 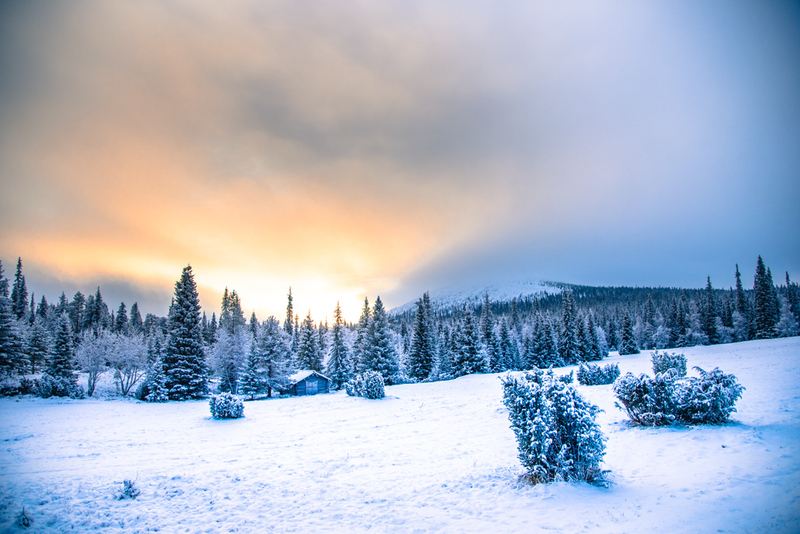 Did you know that reindeer see ultraviolet light! The world looks very different with Rolle’s eyes. Unfortunately I didn’t get to meet Rudolph, as he was resting and saving his energy for the Big Day. But there are big personalities amongst the others as well. The bigger the antlers, the better father material you are in the eyes of the ladies. Lads cannot cheat and grow ridiculously large antlers, however, as it is up to genes and fitness how large they grow. 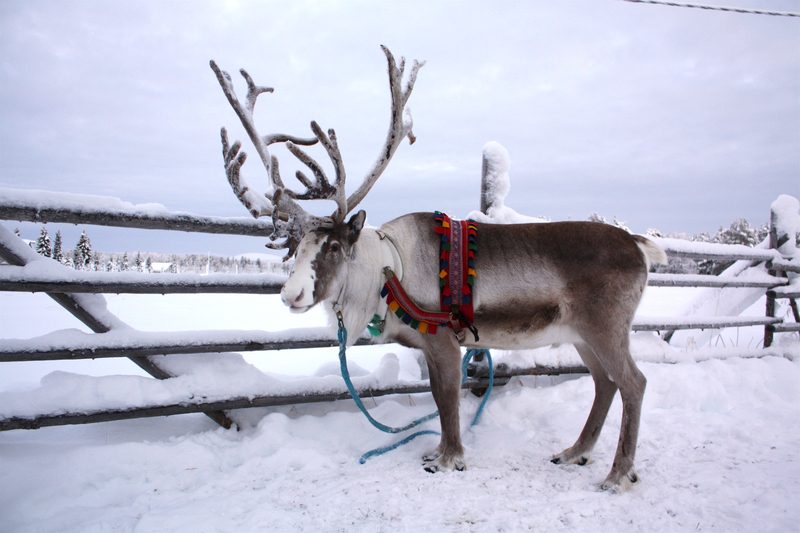 Unlike other deer, female reindeer have antlers too, although smaller ones. Most likely the function is to better defend their young. Antlers grow at astonishing speed, as much as 2 cm per day! Reindeer antlers are the largest of all deers, relative to body size. 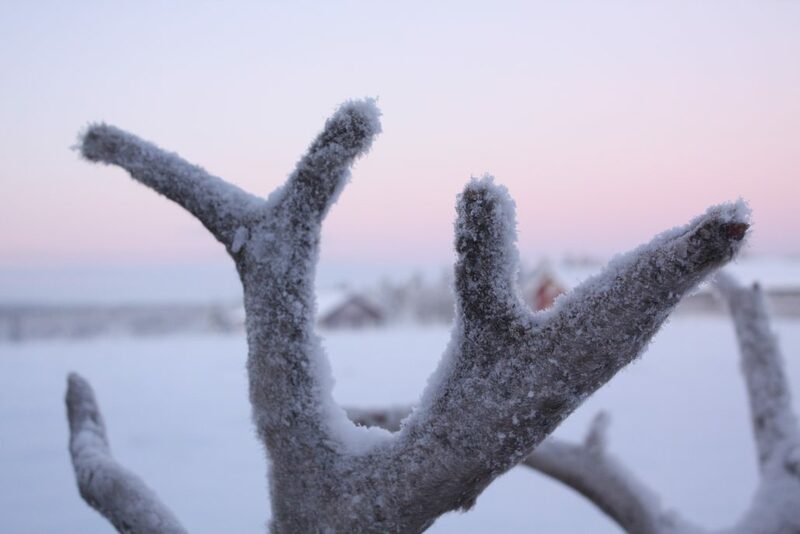 Reindeer shed their antlers once a year, males after the rutting (mating) season. Some hold on to their crown until Christmas, probably to show off when travelling with Santa. Others won’t get rid of them until spring! Big antlers are heavy to carry and not very handy in thick forest, so there is really no need to keep them after the ladies have seen them in Autumn. Females loose their antlers in the summer. 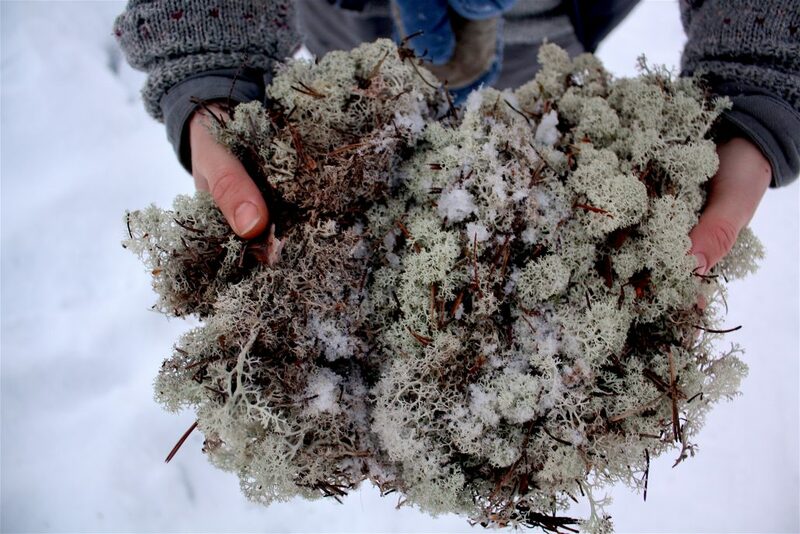 The favourite food of reindeer is lichen. 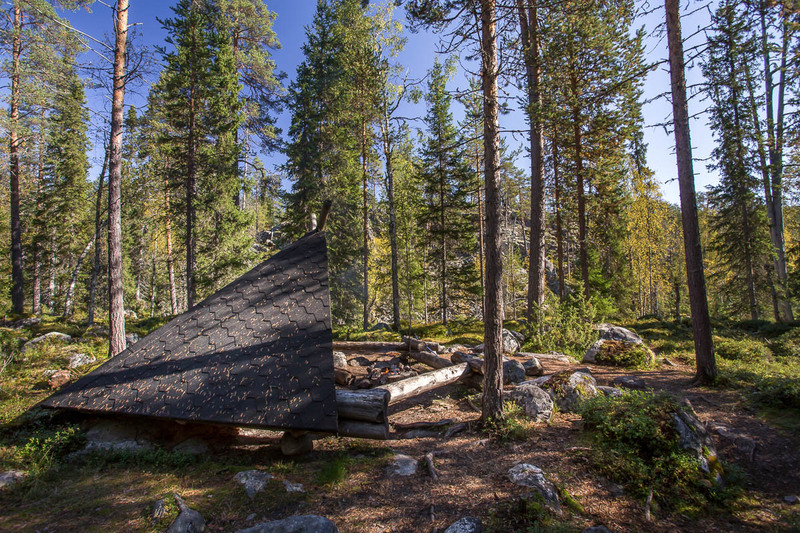 But in the forest during their summer holidays reindeer also munch mushrooms and plants. It has been counted that reindeer eat over 350 different species of plant! The strategy is to pile up weight as much as possible before the long winter. In Torassieppi the elves feed the reindeer an armful of hay a day, plus some protein rich lichen and reindeer pellets. To keep them in shape. 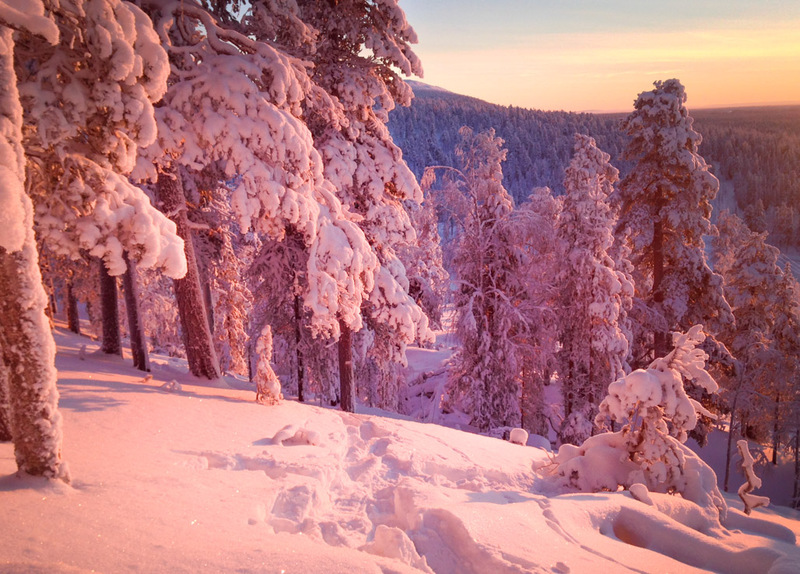 In the winter they smell food under a thick layer of snow. They have a very good sense of smell, it is reindeer’s most import sense. His name is Aaro. He can be a bit moody and doesn’t get along with everybody. Aaro tends to prefer female elves and co-operates well with them! He does like his caretaker Tommi (at the background), with whom he goes sledding often. Reindeer can manage in extreme cold, in -50 degrees of Celsius. My lungs hurt if I ski at full speed in -25 C. Reindeer warm cold air in the long nose before it enters lungs. But the coolest (or warmest) trick is in the fur: They have a very thick underlayer of hair, and overcoat is made of stiff, hollow hair that traps air for insulation. Actually Santa’s reindeer could make their journey by swimming, as the air trapping fur works like a life vest! I personally often get cold feet even in my warmest shoes. 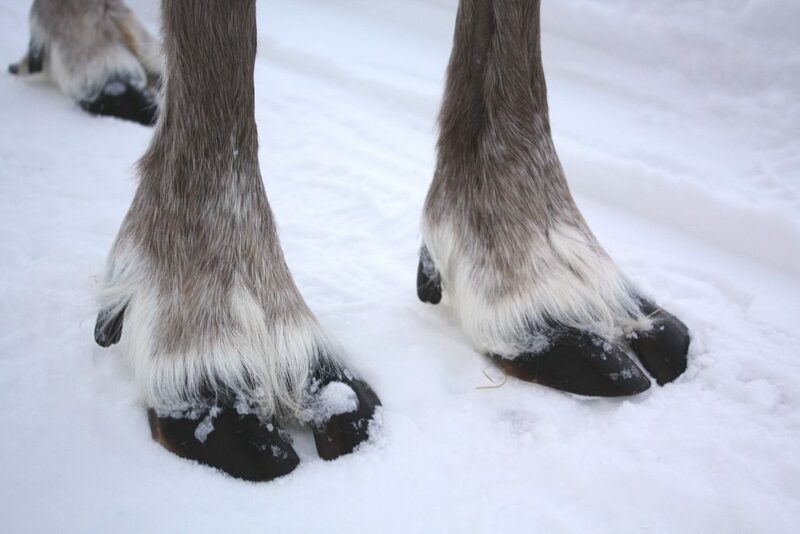 Reindeer don’t care, even if the temperature in their feet goes near freezing point. They don’t get a frost bite as I would, thanks to a specialised circulation system, in addition to a super cool antifreeze liquid in their bone marrow. True story. 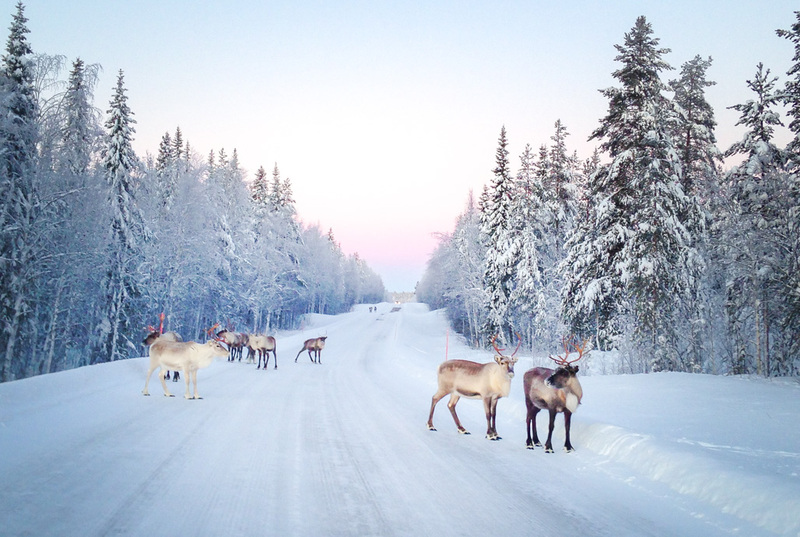 In Finnish we have a measurement poronkusema which means the distance a reindeer runs without urinating. It is 7-8 km in fact. 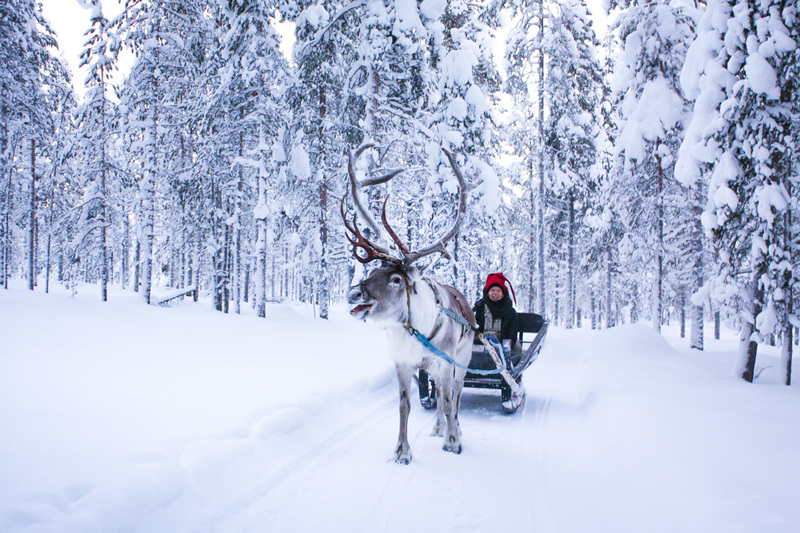 Reindeer cannot run and pee, so when sledding, they must be stopped at certain intervals so they can use the bathroom. I noticed at least Rolle seemed to empty his bladder every time we stopped on our 3 km sledding trip, just in case. It is actually very dangerous for the reindeer if he can’t go in a long time. So if you see something yellow on the snow next to your house on Christmas Day, you know what it is! These guys are sharing a joke. Or they both just love sledding. 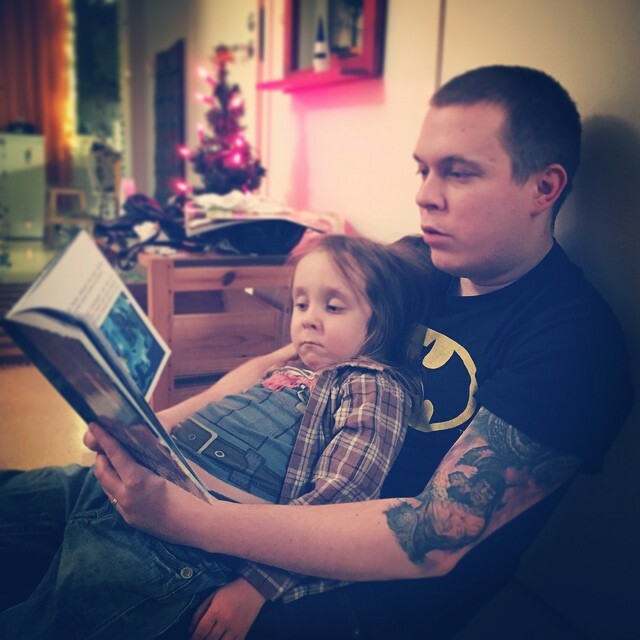 One of the elves is practising with young Harmikas (1,5 years old), who is too young to participate in Santa’s crew just yet. 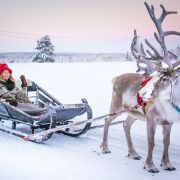 https://finlandnaturally.com/wp-content/uploads/2016/12/torassieppi.jpg 777 1200 Minttu Heimovirta https://finlandnaturally.com/wp-content/uploads/2016/08/finlandnaturally-logo.png Minttu Heimovirta2016-12-22 09:22:102018-11-08 13:04:40What are Santa's reindeer like? 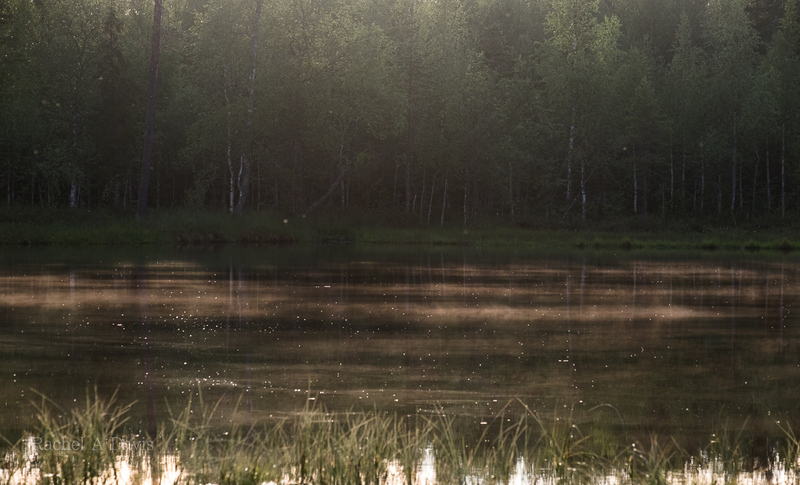 We’d been in the hide for around five hours, slowly watching the summer evening envelope the view before us: a still lake fringed by forest. 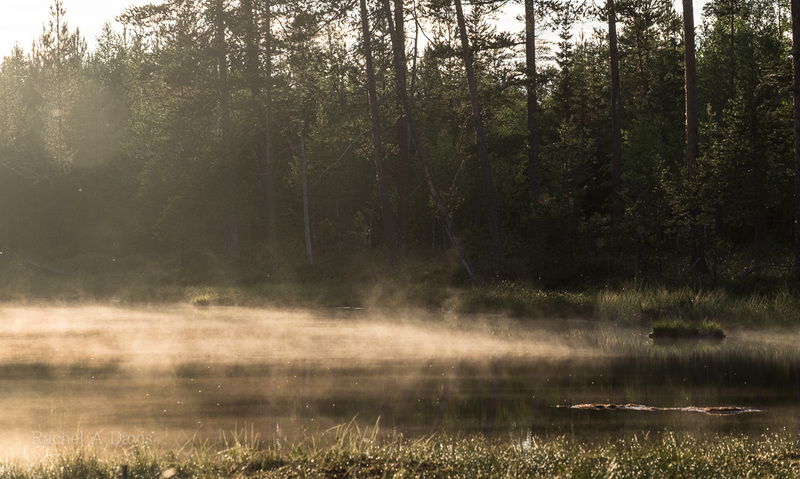 The lake had begun to steam as the sun began to set – the hot day cooling – and mayflies flickered in the golden brilliance. I couldn’t see it a first, then a snout peeked from behind a tree, followed by the furry bulk of a bear as it emerged from the forest to the edge of the small lake. 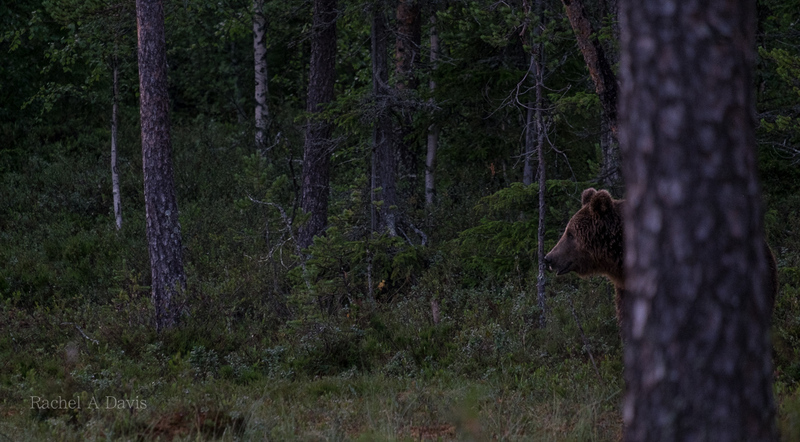 It took a moment to find the bear through the lens on my camera, I’m not used to using a longer lens. I pressed the shutter button. The bear was ambling hesitantly towards the hide; it edged around the lake before reaching a stop and looking straight at us. I fired the shutter again. All of a sudden the bear was alert, spooked. It turned and headed back towards the forest. I realised I’d been holding my breath! The bear meandered around the curve of the lake and came to a stop, snuffling at the water’s edge. The sun had just dipped behind the forest leaving a golden glow filtering through the trees and the night had taken on an ethereal light. A mist danced over the still lake. 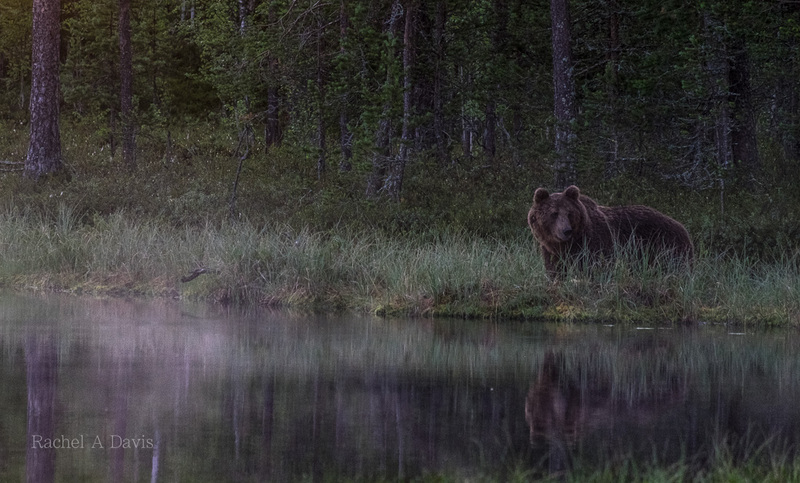 Sniffing the air, the bear was reflected in the watery mirror; I couldn’t take my eyes off the magical scene. A second later the bear vanished back into the forest yet the magical moment hung there for a second: did that really happen? 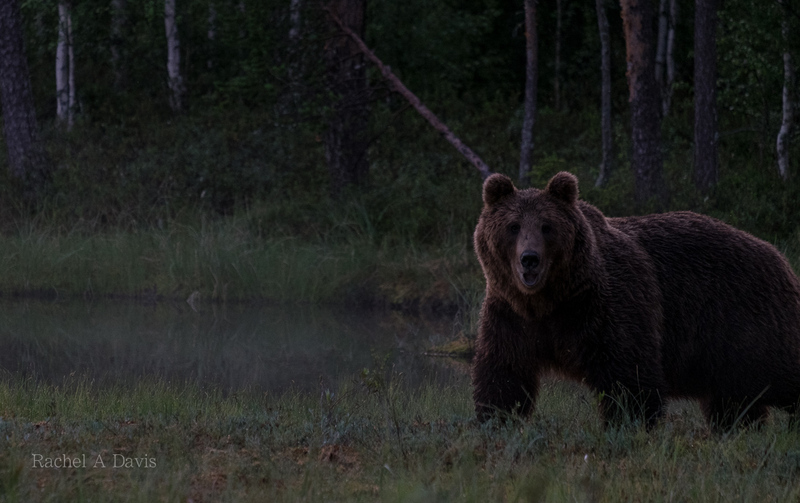 We were in a tiny wooden hide deep in the wilderness – just a few kilometres from the border with Russia – at Wild Brown Bear Centre, a company in Kuhmo, eastern Finland, specialising in wildlife photography of wild bears and other wild animals. After the bear had vanished back into the forest nothing much happened for the rest of the evening except a brief appearance by a red fox. I curled up in the lower bunk of the hide and read a book for a while before drifting off into a light sleep. I crawled sleepily out of the sleeping bag and perched onto the chair, squinting into the twilight, my eyes adjusting to the semi-darkness. The bear was walking towards us, and he was big! He strolled casually past the hide, so close we could hear him snuffle. I remembered my camera was still set up and I fired a few sleepy shots. The settings were all wrong and the photographs were woefully underexposed. It didn’t matter: I won’t be forgetting this moment for a long time. To be so near to a wild brown bear was thrilling: just a thin plywood wall stood between us and this majestic carnivore yet I felt perfectly safe. I’m sure those bears wandered through my dreams that night, I slipped back into bed and the next thing I knew it was morning. Sunlight was streaming into the hide and the view beyond the window had transformed with the dawn. It had been an unforgettable night, woven with moments so magical that they seemed improbable in the harsh light of day. The moments were fleeting yet enchanted: a fantastic story rather than a wildlife spectacle. 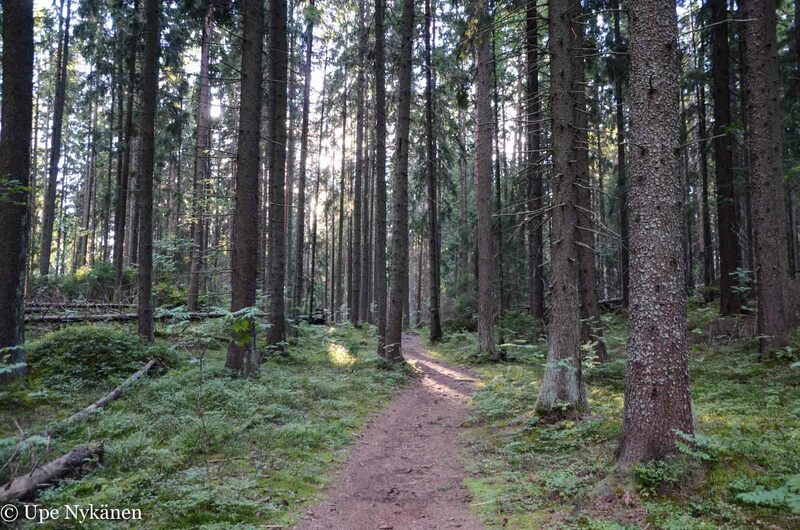 A few days later, I was walking through the forest in a Patvinsuo national park late in the evening, the low sun burned through the boughs as I gathered blueberries. I wasn’t alone in these forests, somewhere deep in its heart were bears, I’d now seen them with my own eyes! 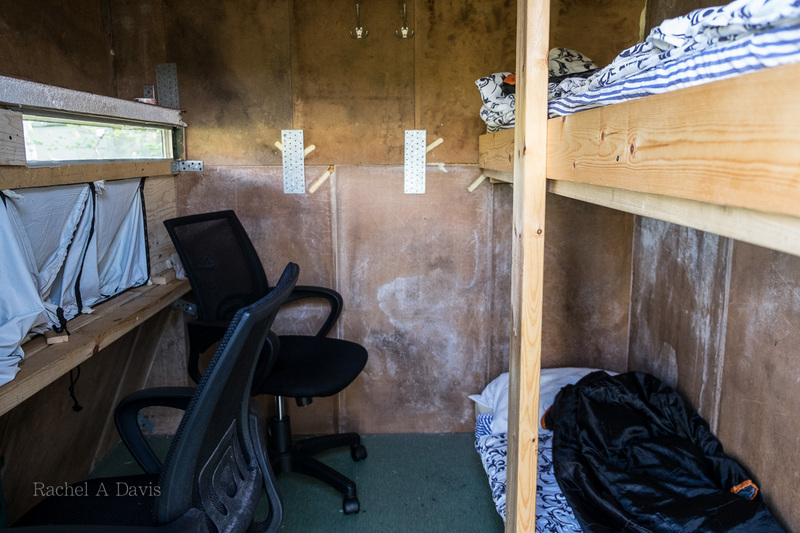 As well as the wildlife observation hides, The Wild Brown Bear Centre has accommodation, however we stayed in our camper on site for a small fee instead and had access to showers and sauna. The bears are completely wild, they are encouraged to wander into the vicinity of the hides with tiny amounts of food left in photogenically strategic places. As well as photographing bears, there is also the chance of seeing wolverine, wolves, and lynx. 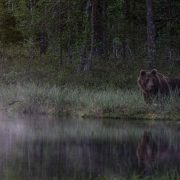 We visited Wild Brown Bear as independent travellers, through our own choice and paid for the experience with our own money as part of an amazing two month road trip around Finland over the summer of 2016. This story was originally posted on my own blog www.vagabondbaker.com, I have re-edited some of the text for this post. I scanned the Ölokyn Ähkäsy (this roughly translates as the Canyon Groan in local dialect) ring route on the map. It didn’t look too bad, only around 10 kilometres long. However, when I asked about the route at Hossa’s visitor centre and talked to people who had done it, all of them warned me that it was extremely tough and demanding. I needed to set aside at least 5-6 hours. Apparently there are great changes in elevation and lots of rocks and roots. But I was willing to take on the challenge. I put on my hiking boots and backpack. In my backpack I had packed the minimum amount of gear: a camera with acouple of lenses, a couple of sausages, a sandwich and 2 bottles of water. It’s important to be careful on the route, as your mobile phone won’t pick up any signal apart from at the highest points. 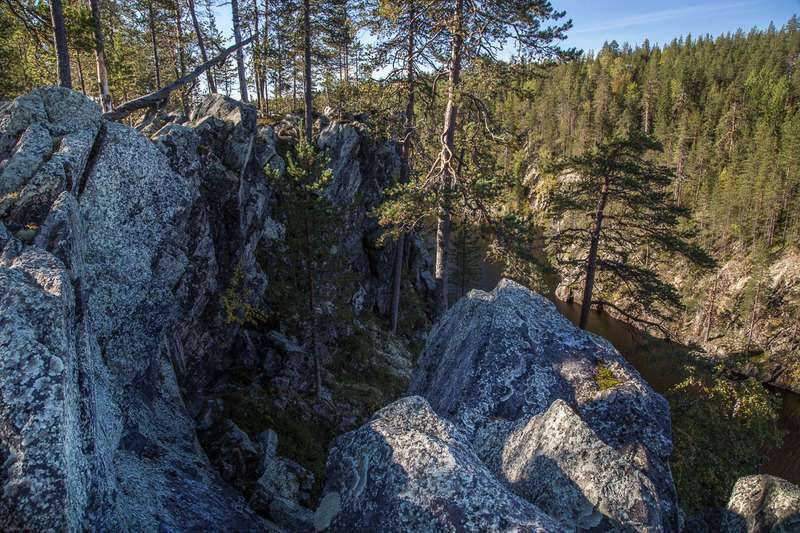 As the crow flies, it’s about 5 kilometres along Ölökyn Ähkäsy to the Ölkynperä (Canyon rear) lean-to and back. Just by looking at the map you can tell that the views are going to be rugged and spectacular. After all, we are at Julma Ölkky (Cruel Canyon), one of Finland’s three largest canyon lakes born of a large crack in the land. 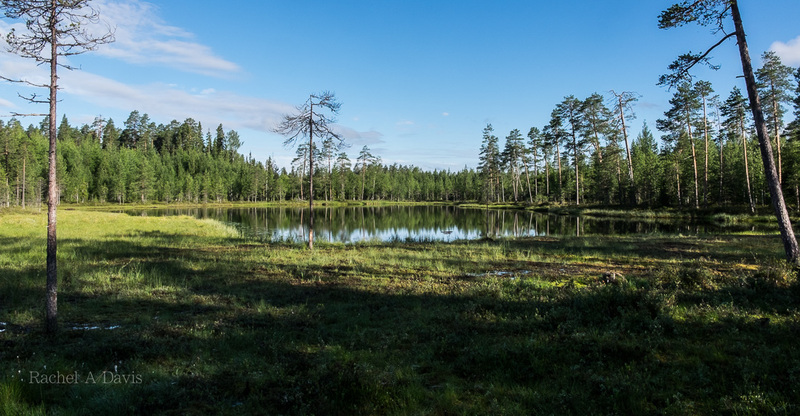 The others two are Iso Helvetinjärvi (Big Hell’s Lake) and the Toriseva canyon lakes in Virrat. The birth of the gorge took place more than 2 billion years ago. The canyon is a rift valley, which is caused by earthquakes or transitions in the ancient continents. Later the ice age honed the rift, but the traces are clearly visible on the vertical wall that towers almost 50 metres out of the lake. The canyon already looks quite impressive when viewing it on Google Earth. 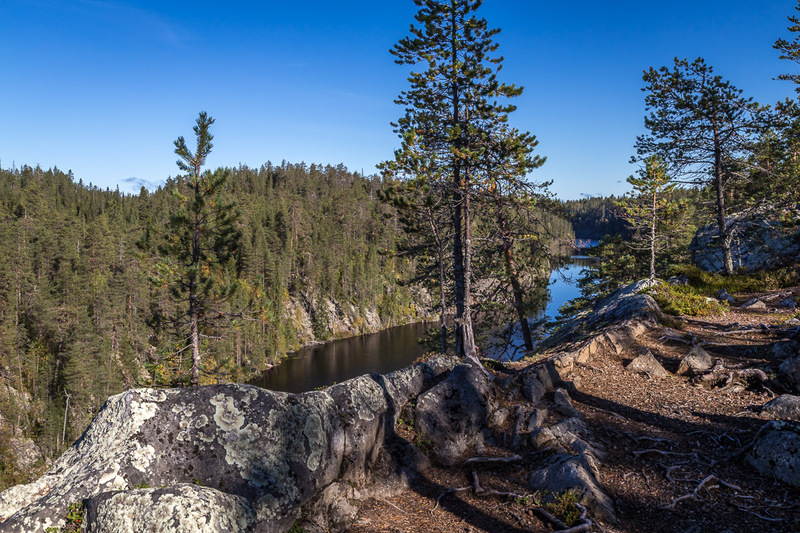 The Toriseva canyon lakes and Helvetinkolu in Helvetinjärvi (Hell’s Lake) National Park were formed in the same way. This canyon formation process is however completely different to that of Oulanka’s canyon, where water and ice have carved the gorge from the bedrock. 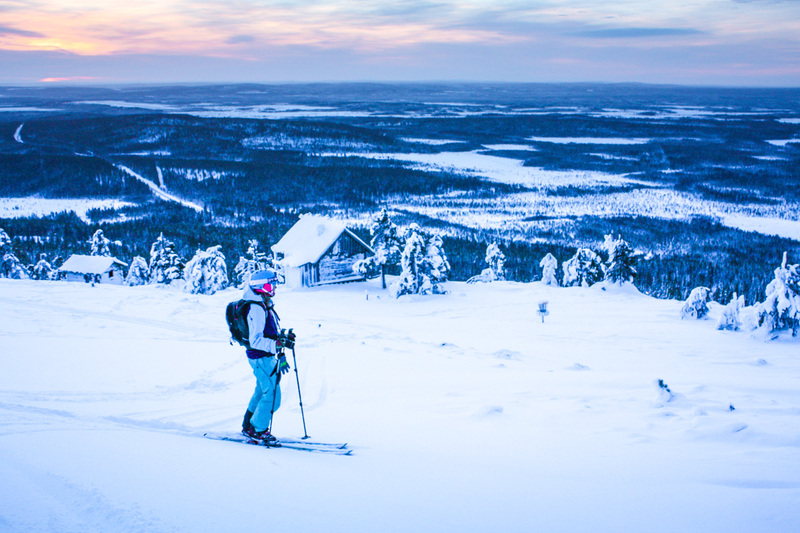 The trail starts from Julma Ölkky’s parking place, which is around a 20 minute drive from Hossa’s visitor centre. It must be said, the road was not in the best condition. A little Fiat will hit its undercarriage, if you don’t drive carefully. At the starting point there is a summer cafe, which had just gone into hibernation. It’s open until 31.8. 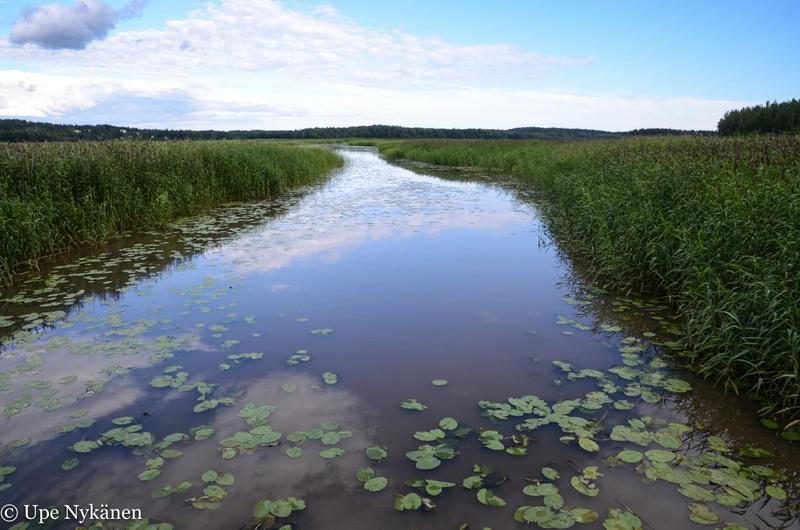 When it’s open, you can explore Julma Ölkky on a guided boat tour. I approached the circuit following the signposts, which take you counter-clockwise along a route marked with orange dots. I chose 10am as my departure time, as the sun was shining appropriately from the east, its light hitting the west shore. The canyon’s orientation is pretty much north to south for the whole length, which meant that for the final part of the journey the sun would be shining from the west and lighting up the canyon walls on the eastern shore. Already half a mile in, the scenery was reminiscent of a fantasy film. I felt like calling Hollywood and asking them to come here and film a remake of Lord of the Rings. On the outward journey, the path runs right along the edge of the rocks, so I ended up having to stop repeatedly to take pictures of scenes that were even more impressive than the last. What a nuisance. However, those with vertigo need not worry. You don’t have to go so close to the edge if you don’t want to. Just as I thought I had reached the best spot, a more spectacular view opened out before me a few minutes along. Every now and then I heard the sound of a waterfall. A number of waterfalls formed from streams flow out from the canyon walls and from some of them you can see rainbow colours in the evening sun. Those who like climbing can scramble up the cavity called the Devil’s church, where you can find a guest book. This time I left the Devil in peace and continued my journey. Approximately halfway to the lean-to, the canyon splits into two parts. The lake continues along the western gorge and the eastern depression, Sitkansola, is essentially swamp. The scenery certainly didn’t get any worse. Finally I reached the lean-to at Ölkynperä, where I met 3 sausage barbecuers. I told them about Värikallio (Colour Rock), a few kilometres away, where you can see amazing rock paintings from thousands of years back. Together we agreed that you can find everything in Hossa, and that it had most definitely earned its new status as a National Park in honour of Finland’s 100th Year of independence. After this, no more people crossed my path. On the way back the terrain is more forested and some of it is quite far from the rock’s edge. It was this proportion that was full of steep climbs and descents. However, in a few places, I came across a viewing point. Julma Ölkky’s own ancient rock paintings are near the water’s edge, but they can be better seen by boat. 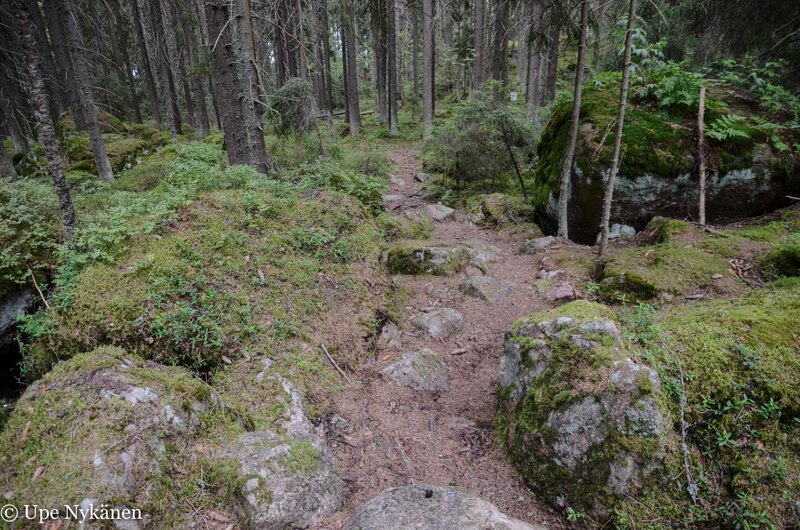 The Ölökyn Ähkäsy route is indeed challenging, but I still wouldn’t say that it’s a bad route, as long as you are in possession of good basic health and your legs function properly. I completed the trip with a few photos and breaks in a total of 4 hours, walking on my own. With a group, it would probably take 5-6 hours. And if you go the gym, it might be a good idea to do some extra squats! I recommend wearing hiking boots to protect your ankles, but in good dry weather you will probably be fine in trainers. Doing the trek in autumn, I had to cross a few swampy areas that were a couple of metres wide, which would have meant my socks getting wet if I wasn’t wearing proper hiking boots. I don’t recommend the route for children, unless they have a lot of hiking experience. Even my 67 year old father stayed behind at the cottage making food. Although this wasn’t due to his age, rather the knee surgery that he had a couple of months ago. Making the most of digitalisation, I saved my route onto my mobile and in reality it works out at around 12km, with changes in elevation on top of that. From a scenery freak’s point of view, I must say that it’s an impressive canyon and totally underrated. Perhaps when it becomes a National Park, awareness of this amazing place will grow. 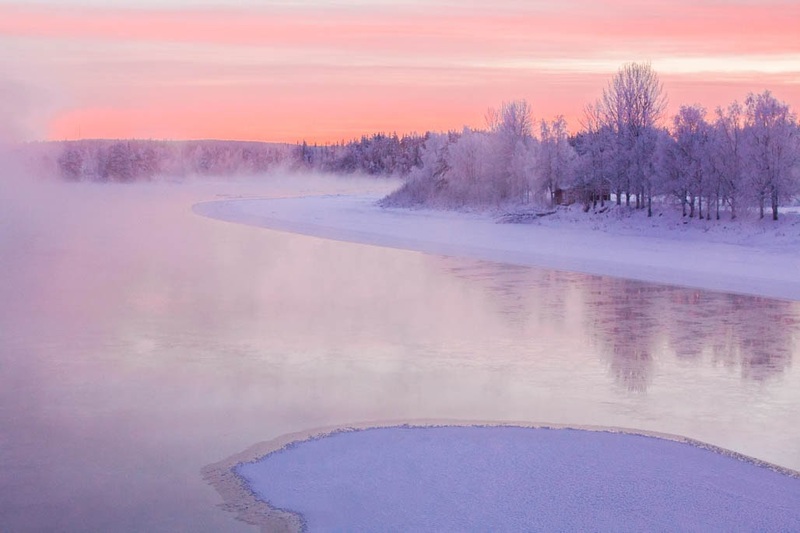 Even though more publicity does of course mean more use, which carries its own risks, it is still the kind of place where all Finns should be encouraged to come and marvel at their own natural wonders instead of jetting off to Gran Canaria. 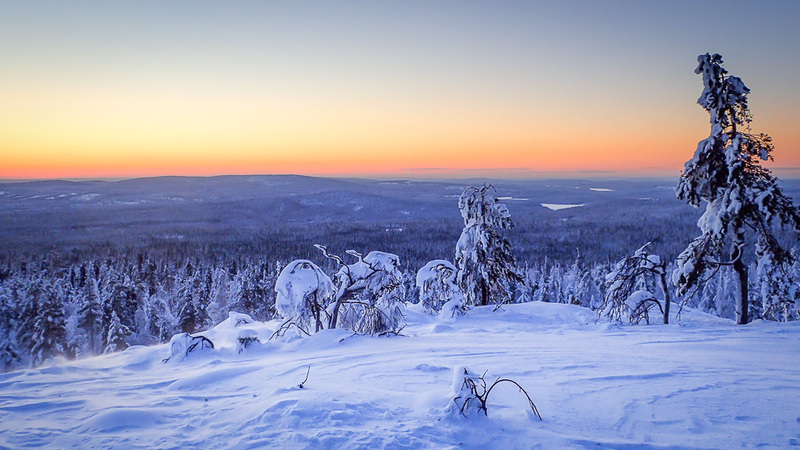 Lapland is of course Lapland, but you don’t always need to disappear beyond the arctic circle to see something unique. Highly recommended! 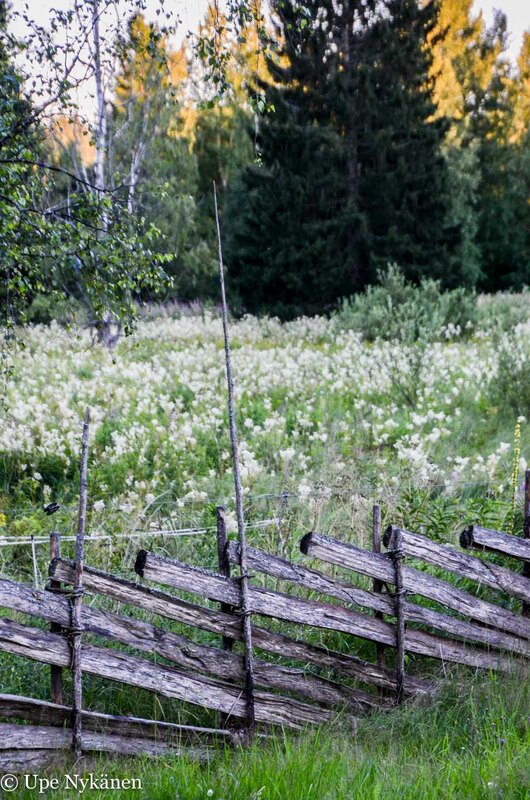 This article was executed in cooperation with the municipality of Suomussalmi. The author stayed at Camping Hossan Lumo during the trip. 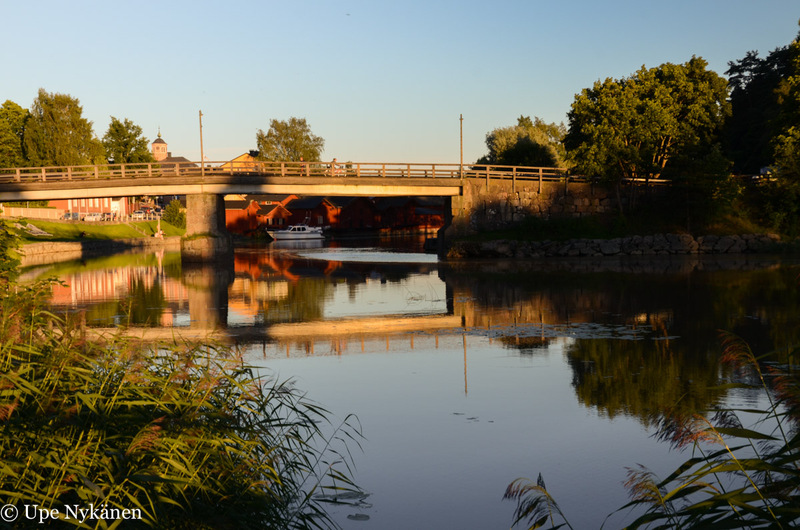 Sikosaari (Pig Island) is situated in Porvoo river’s estuary, just over two kilometres from the centre of Porvoo. 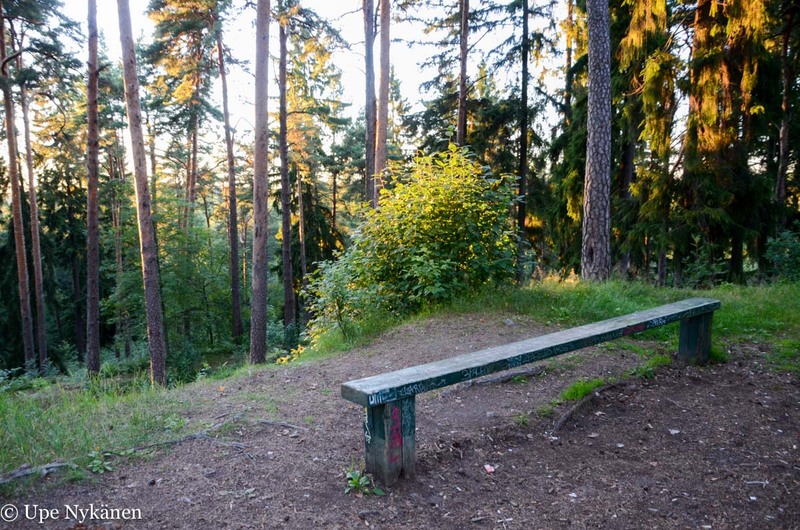 In the past, it has served urban dwellers as forestry land and pasture. 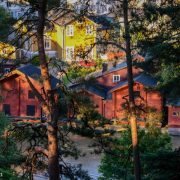 The island is a part of Porvoo’s National Urban Park, which comprises a variety of significant historical areas and natural sites. 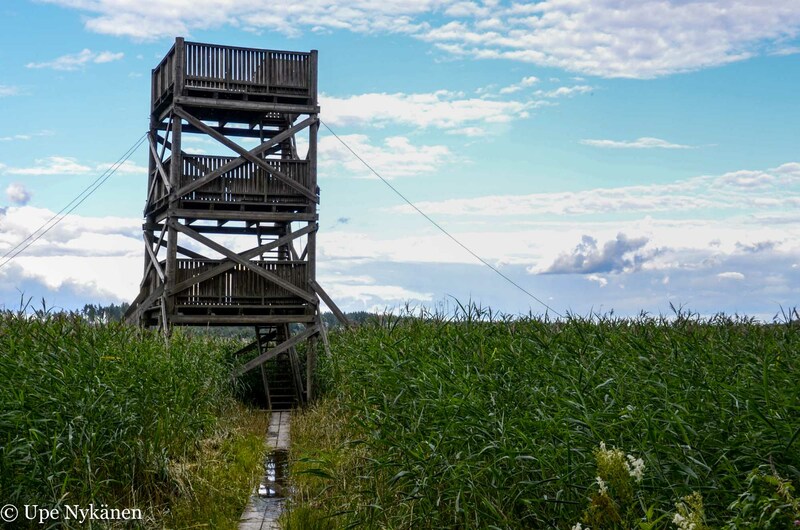 The 1.5 kilometre nature path and a birdwatching tower can be found in the northeastern part of the island. 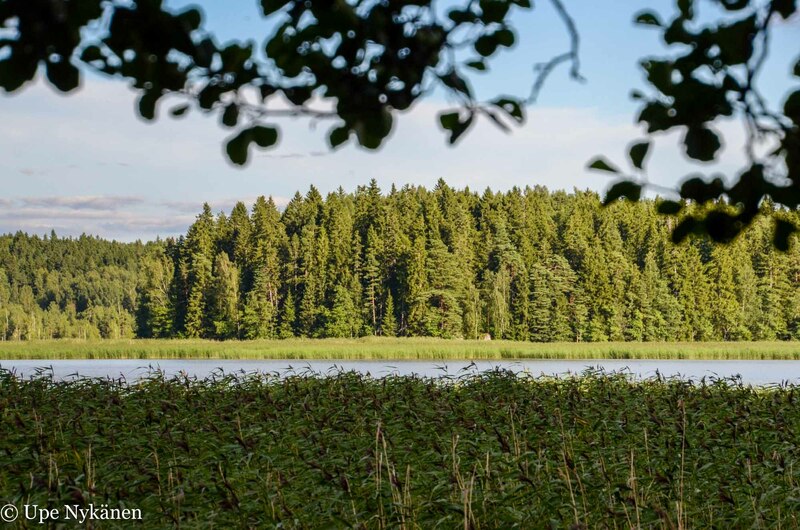 Sikosaari’s name (Pig Island) isn’t as poetic as, say, Sulosaari (Grace Island), but don’t let that bother you. You won’t meet any pigs there either. I did a cycling trip using the Jopo bike that Visit Porvoo provided. 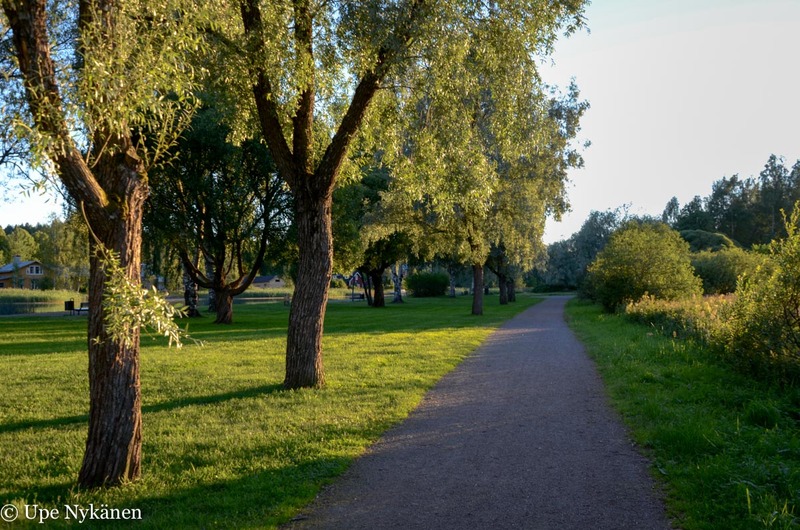 The beautiful winding route alongside Porvoo river takes you to the island on an easy, even path, and as you get closer to the island, the wetlands appear to continue as far as the eye can see. In the middle of the reeds there are only a few, narrow channels, along which you can travel by boat or canoe. 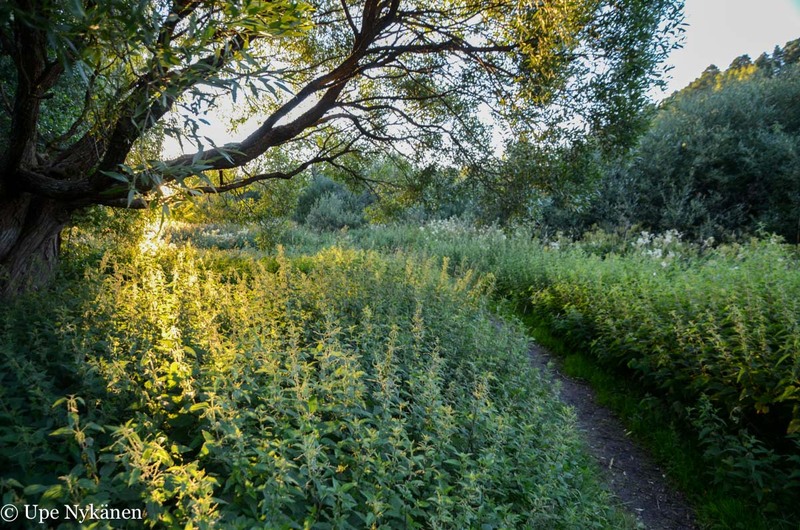 The reedbeds would soon become overgrown if selected waterways were not kept open by humans. The raised road leading to the island delivered me to my destination effortlessly. But soon I had to brake, as the sign for the birdwatching tower indicated right. I parked my bike on the side of the road and started walking on the even path that crossed the coastal grove. Meadowsweet flowers wafted their scent in the air, raspberries jumped into my mouth with a little assistance, and there were only a moderate number of mosquitoes. Sikosaari birdwatching tower is one of the highest in Porvoo, so I knew I would be able to see far. A few cables had been secured to the corners of the tower, probably to secure it in strong winds. I looked down to the duckboards leading to the tower and noticed a watery patch. Had I crossed on that partially submerged plank, my trainers would have gotten soaked. As birdwatching towers tend to be by water, it would be sensible to take rubber boots in wetter weather. I hadn’t really thought about this, as it had been sunny and dry for many days. I removed my shoes on the rock and carried them with me as I took on a refreshing footbath on the way to the tower. Besides being cold, the water didn’t really feel like anything. I climbed to the third level barefoot. 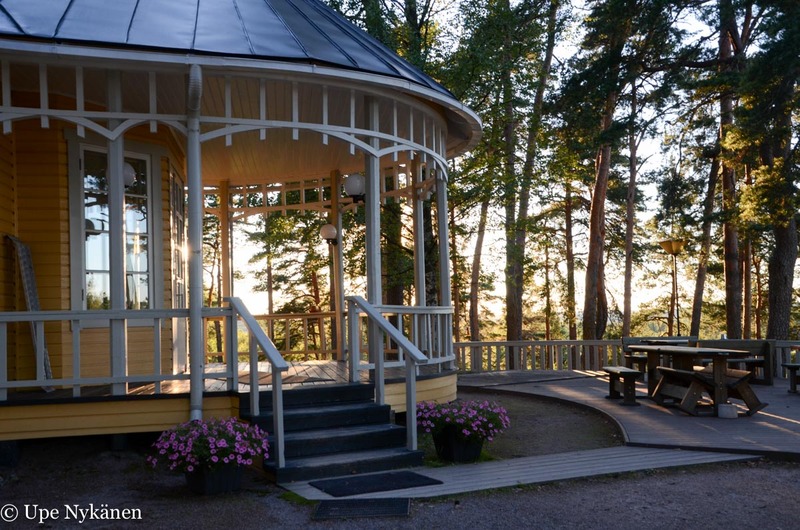 From the birdwatching tower you can see clearly towards the centre of Porvoo, with Ruskis bird tower on the opposite shore, and Ekudden’s birdwatching tower near it, towards Stensböle. There is plenty of room here for birds to nest, as the movement of humans is limited in such dense reedbeds. I wonder what this looked like 400-500 years ago? The reedbed was probably much smaller and the gulf’s waterways wider for boats, considering the land has also risen out of the sea since then. 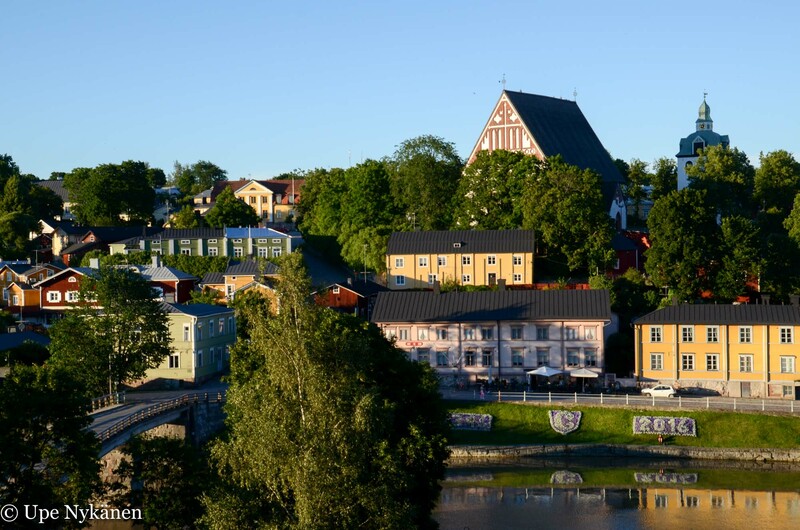 Sikosaari belonged to the City of Porvoo as far back as the year 1602. In 1550, at the same time as Helsinki was founded, our then ruler, the Swedish King Gustav Vasa discontinued Porvoo’s city status. It had been founded in 1380 and was at that time Finland’s third oldest city. 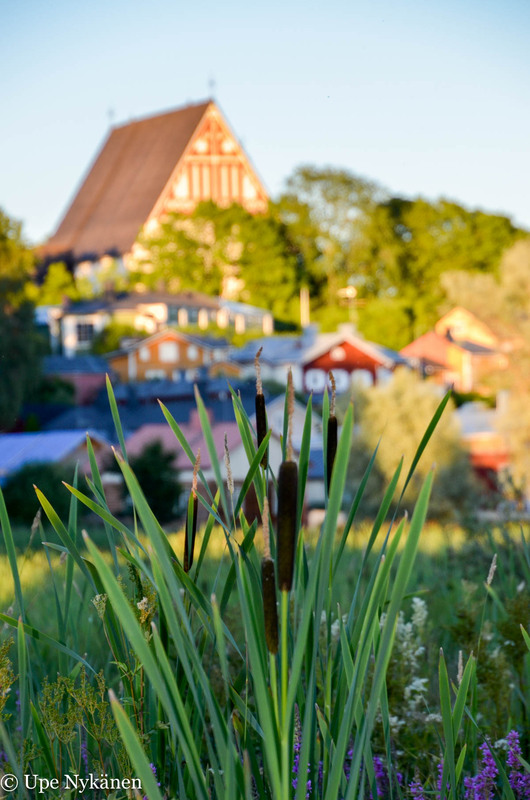 However in 1602, Porvoo got its city rights back from King Charles IX who, in the same year, donated land from Sikosaari to the city to complement an earlier donation from 1546. After the tour of the birdwatching tower I hopped onto my bike and cycled a little further on the path. 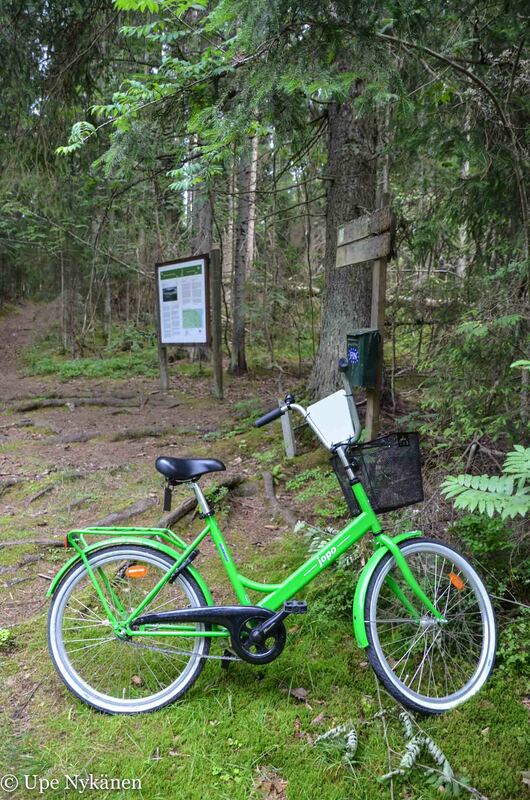 Sikosaari’s nature trail appeared only a couple of hundred metres along, so I parked my bike again. The wooden signposts for the trail have deteriorated over time, but the trail’s information board was in perfect condition with not so much as a smear. 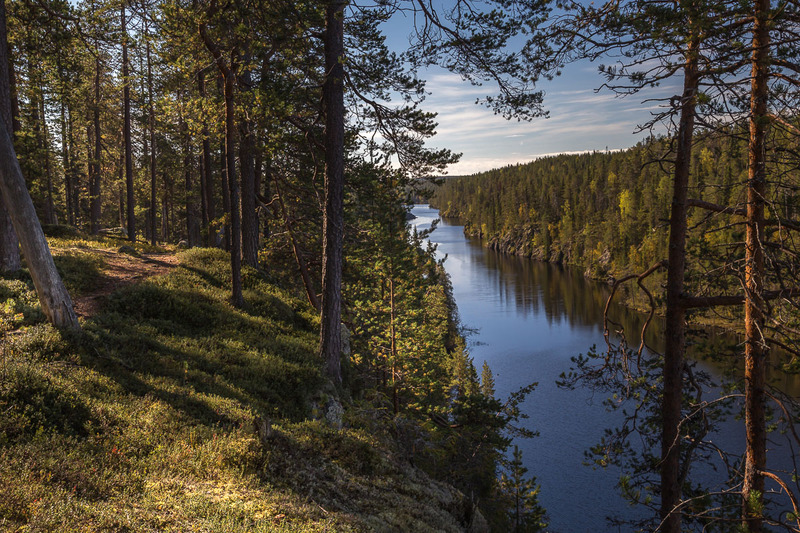 On the departure point’s info board you can study Sikosaari’s history and familiarise yourself the nature trail in advance, with the help of the more detailed route map. The island’s forests have suffered extensive logging, but the situation was calmed by defining a protection zone around the coast. 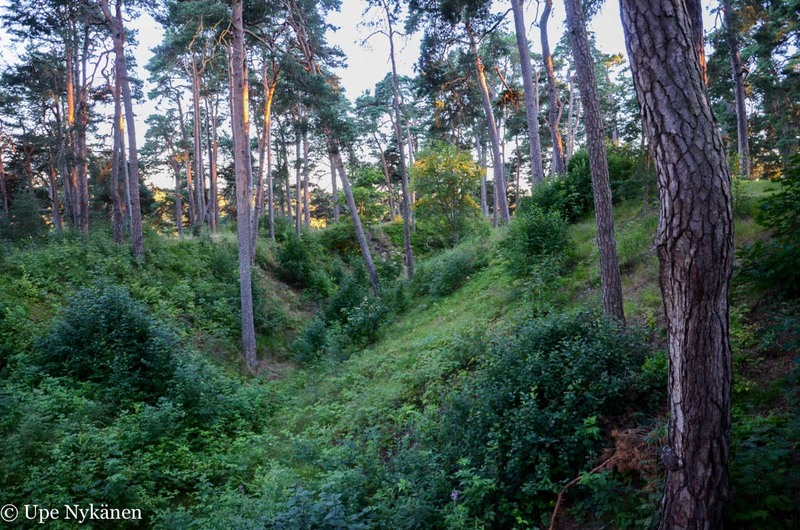 According to the info board the current woodland has been able to grow in peace for around 80 years. 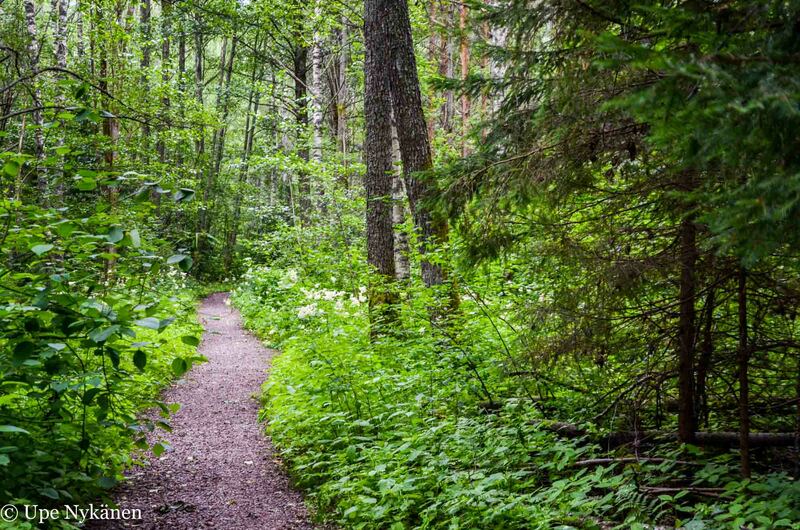 The nature trail’s history goes back to 1985 and from it you can explore forest as well as coastal ecology. So into the woods! 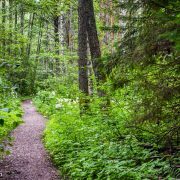 I was welcomed into the coniferous forest with the whine of a few mosquitoes, but they didn’t bother me as long as I kept moving… only when I came to a standstill. Alongside the nature trail, I spotted excellent looking mushroom and berry picking areas. There were plentiful wild blueberries on these clumps. However I didn’t investigate mushrooms any further. A mushroom trip is its own thing, which you need to be prepared for not only with a mushroom knife, but with more time. Around the nature trail there were plenty of rocks in the shade of the fir trees. The grey granite gradually started to disappear under a green blanket. All kinds of different mosses grow on rocks along with who knows what else. 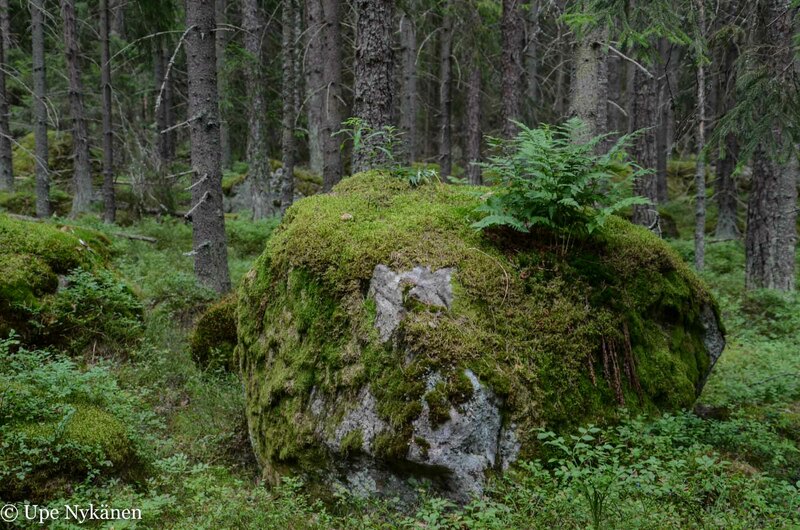 Some delicate plants or even a tree could use a mossy boulder as a growing bed. On one rock, ferns grew out of its head like a coquettish hat decoration. Another rock had a very rough, pockmarked surface. Even the colour of the stone was not just grey, but reddish hues could also be seen. 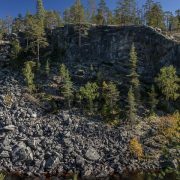 This kind of rapakivi granite has been extracted since the beginning of the 1900s when Sikosaari was a quarry site, providing building materials for the urban dweller and his streets. 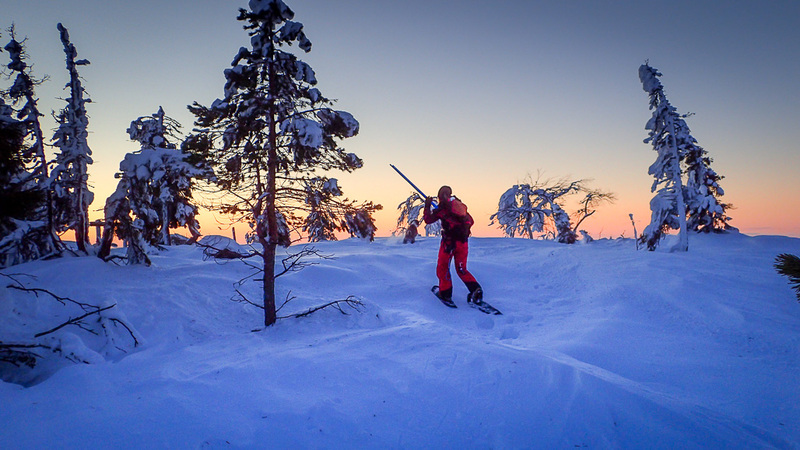 Sikosaari has been an abundant resource for many kinds of activities. 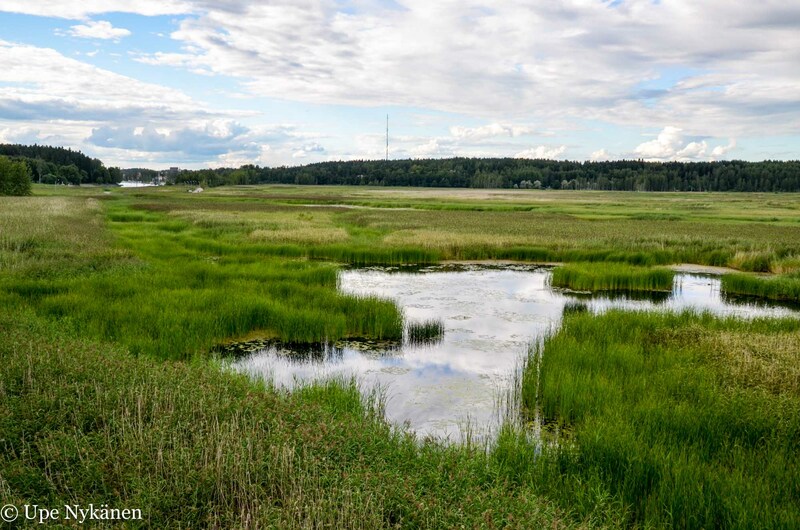 The island’s clay was used in brick-construction, forests provided fuel and construction wood (until it was necessary to restrict logging), a pilot station was set up in 1802 and the island’s western part has served as a dock since the 1850s. I walked forward on the path, full of the most awesome colourful moss carpet and arrived at some smooth rocks. Because the island doesn’t have a fire place or other picnic spots with benches and a table, this dry rock was a good place to enjoy a snack. Close to the rocky ridge I noticed a small but somewhat whimsical ‘cave’. 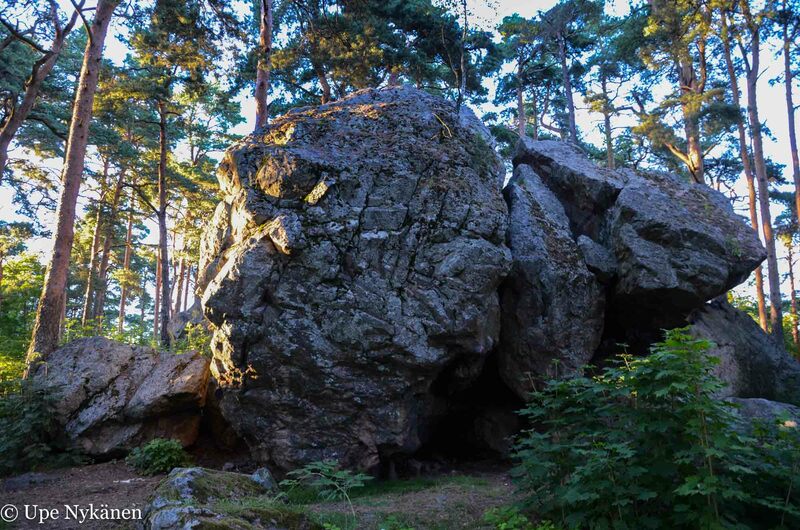 It was made from big slabs quarried from the erratic boulder, forming a cavity easily accessed by humans. Could I be bothered to crawl in there? I couldn’t resist the temptation, so in I wriggled… In such a heavy duty shelter provided by nature you could at least protect yourself from a rain shower (I can’t guarantee that water wouldn’t flow in from the larger rock above) or otherwise, take a nap! For kids this is a brilliant hiding place. The nature trail soon curved away from coastal waters. The beach was already shimmering behind the spruces. If in some parts the path is easy to walk, you might want to be careful in the stony parts. Tree roots can also surprise you as they snake across the path. At the beginning of the trail, I expected a kilometre and a half to take around an hour. But it’s worth noting that a nature trail is not a place to rush. There are separate jogging paths for that. 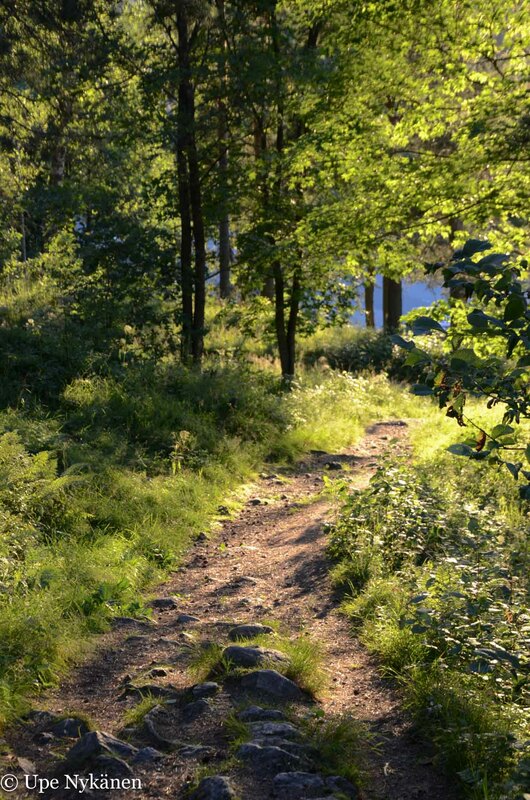 A slower pace can give you more time to enjoy nature, in which case the path’s stones help you to focus on the moment. Descending the trail I thought of stories and tales, for the rocks around me were so extraordinarily beautiful. Daylight turning into evening light didn’t bother me at all, just brought its own sweet atmosphere. Soon there were even larger erratic boulders dotting the mossbed in front of me. I took my seatpad from my backpack and sat down with my back against a rock wall. Some considerable rocky relics have been left here since the ice age, most likely not pushed here by giants, as was once believed. 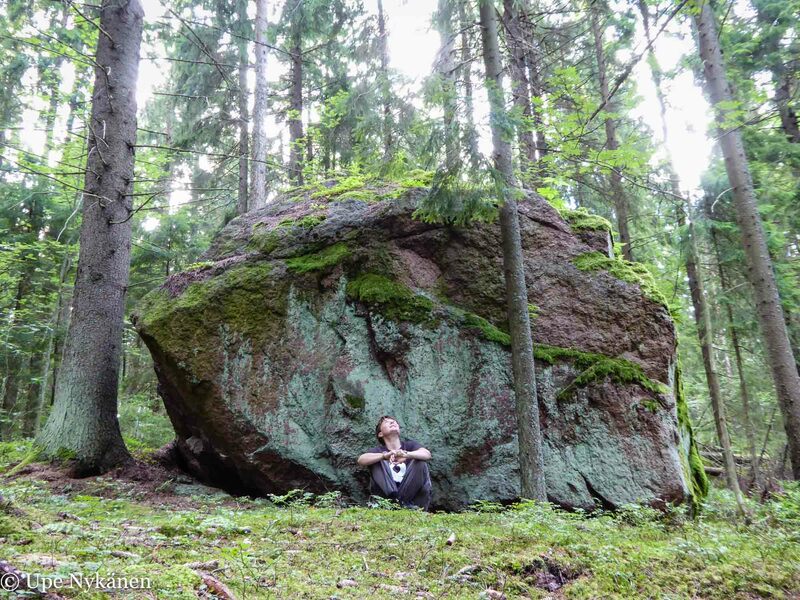 At the same time I remembered one trip to Jyväskylä’s Muurasalo, where I found even bigger but similar rocks in amongst Lake Päijänne’s coastal landscape. 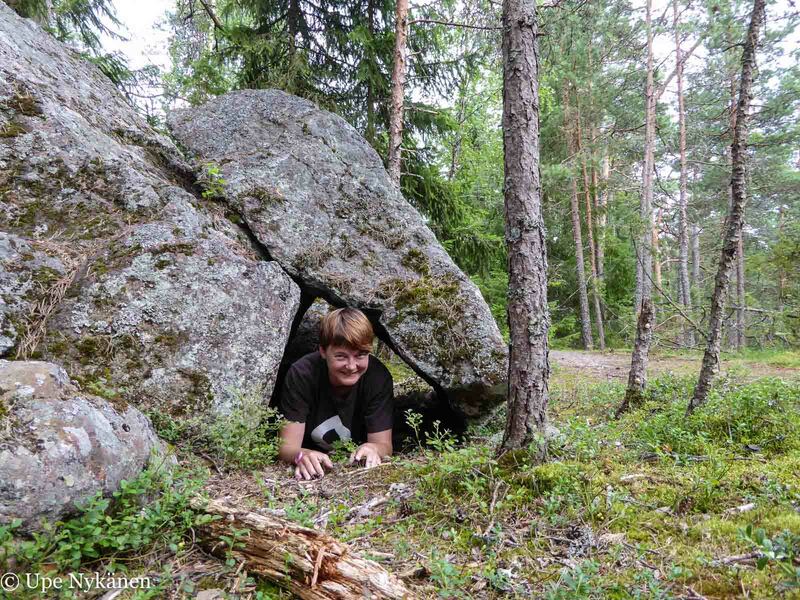 Similar greetings from the ice age can be found all around Finland. The path guided me next to the shore’s edge, where a promising sign was waiting: Bird Rock/Fågelsten. I wondered first if it was a birdshaped rock. Then I walked around the coastal Rowan trees and in front of me was a stone boulder that you could climb up via little wooden steps. The handrail made for the rock was in poor condition, but it didn’t matter, the rock wasn’t too high. From bird rock you see Stensböle’s bay better than if you were standing on the ground, even though the terrain is flat. Abundant tall reeds dominate the landscape. So much so that the reed sea looks like it intends to slowly swallow the actual gulf. Near bird rock an information board can be found, revealing the life of reeds. It also helps with bird identification, if you happen to see any feathered friends in the landscape. Binoculars are always good to have with you on a trip around here, as with your bare eyes there is no way you’d be able to make out the differences in the birds and their feathery details. A small section of the route was marked out on top of the water by duckboards. 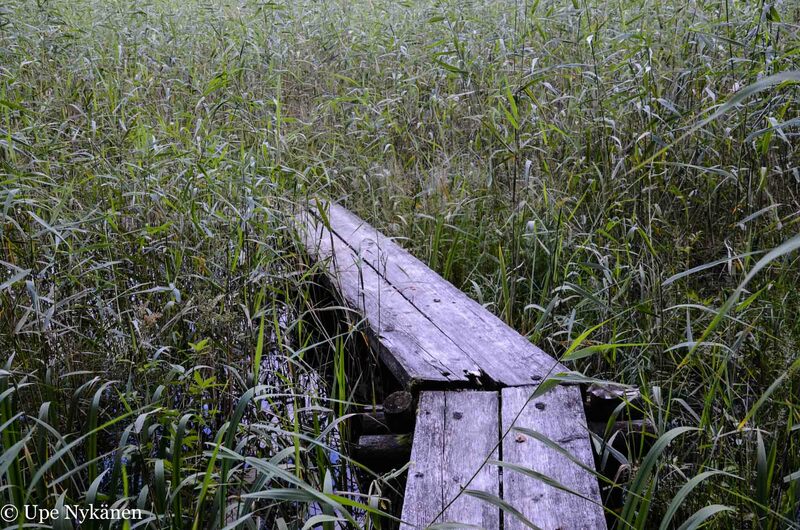 Duckboards through the reedbeds was a nice idea, but time had taken its toll on the poor planks. These structures from 2007 had been rendered useless in parts. From the direction of bird rock, you could only take a few steps on the boards before you came across ones so skewed that you could only attempt to tackle them the same way as you would parkour. I don’t recommend it. I returned to dry land and followed the planks along the coast towards the south for a while. There the structures were intact enough, that I could walk a small part of the way through the reedbeds with dry feet. Duckboards are always subject to wet conditions as well as the people that walk upon them. In this case it seemed that ice caused the worst damage. In the meantime, it’s safer to do this part of the trip along the coast, until the duckboards are fixed. 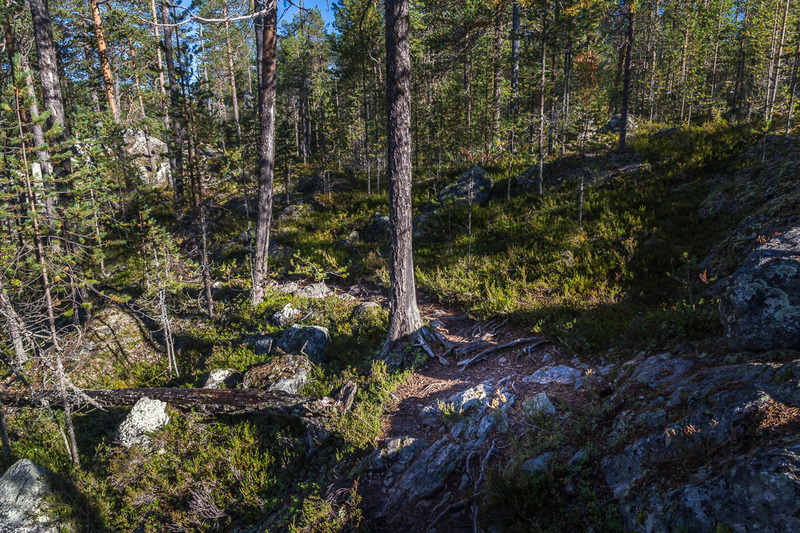 After the duckboard section, the nature trail turned back towards the island interior and towards Sikosaari road. 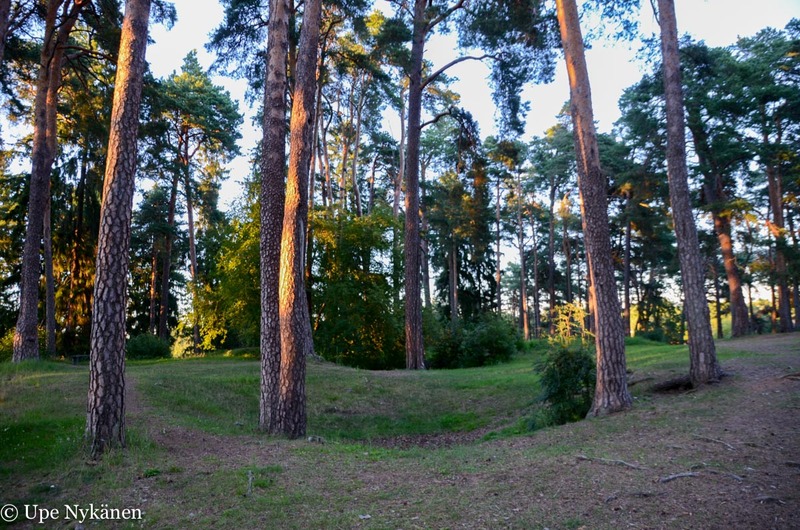 I walked on the path softened by spruce needles towards the evening sun, and enjoyed the silence of the summer evening, making out a few more large rocks from the slopes. I came upon a fork in the path, where there was no sign, so I ended up guessing which path to take. I followed my instinct and the right path turned out to the the right choice. Soon the path joined up with Sikosaari road and I walked towards the P sign following the dirt road on the right back to the trail’s departure point and towards my bike. 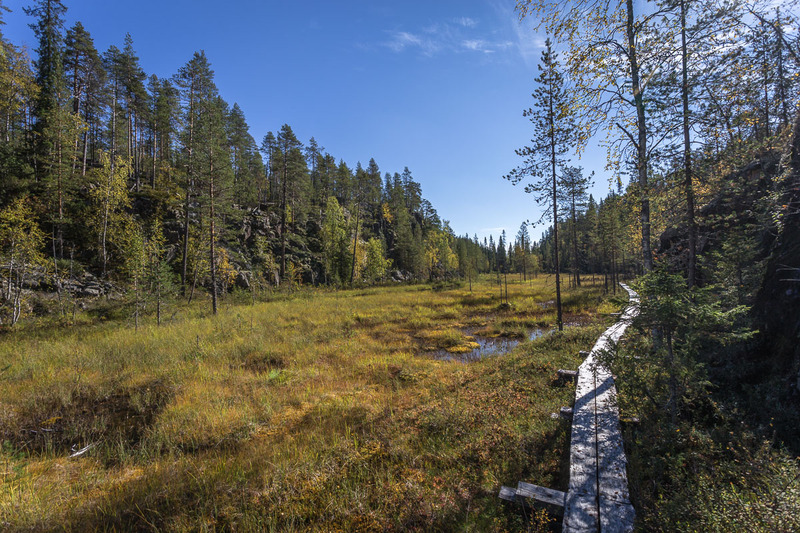 Along paths and small roads you can wander along a wider area of Sikosaari than just the nature trail. Since the island isn’t fully for recreational use, there are also a couple of farms, as well as private and holiday homes, you should keep your distance and leave the private areas in peace. The island’s southern part, the old forest south of the farmland, is a protected as a nature conservation area. 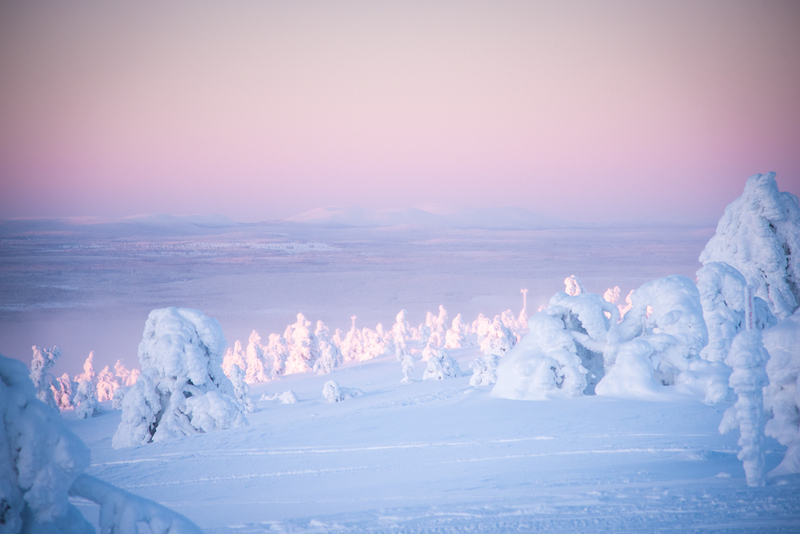 Sikosaari is a laid-back and easy to reach location for a day trip, especially suitable for families. There is no fire pit, but if you want to have a picnic on the island, it’s worth taking a thermos bottle, cold snacks and sitting pads. 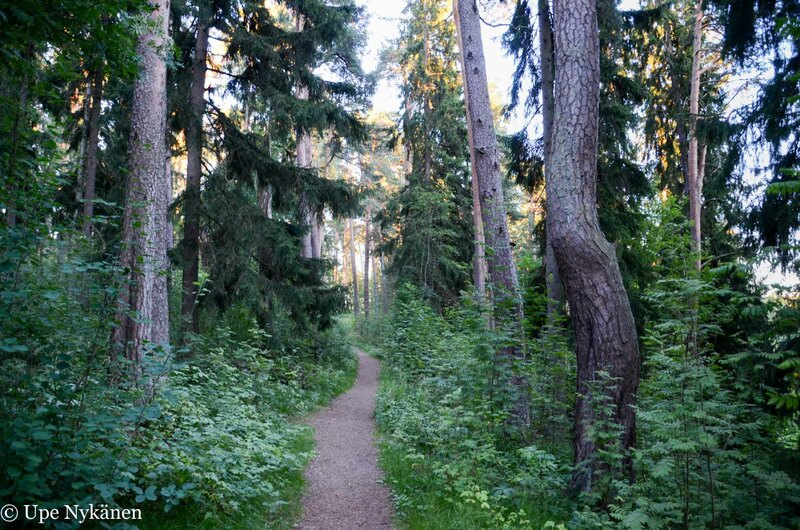 Location: Sikosaari is located south of Porvoo’s town centre and from there the journey is just under 3km, so it’s easy and also recommended to take a trip by bike or on foot. The birdwatching tower and the nature trail start from Sikosaari road and there are signs on the side of the road. At the birdwatching tower is a modest opening, in which a couple of cars can fit. The nature trail departure point similarly has limited space for cars. The island has no bus connection. 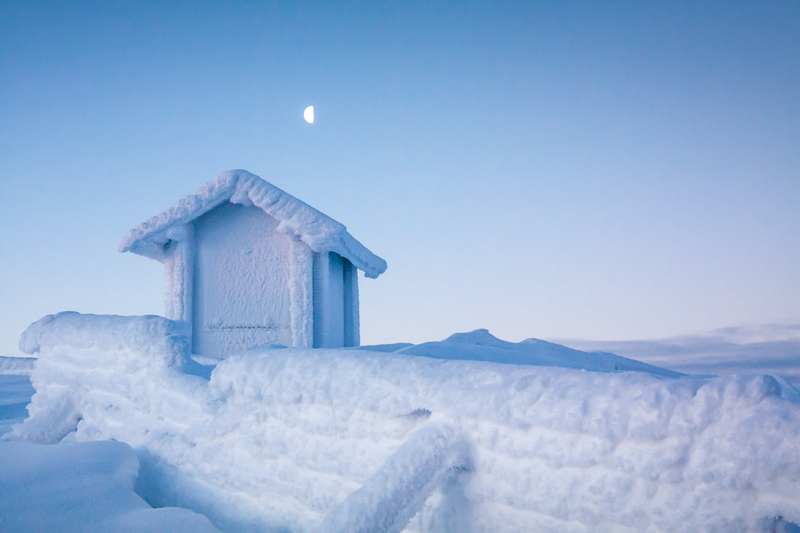 Lauri Maijala is not what you would call an ordinary nature photographer. 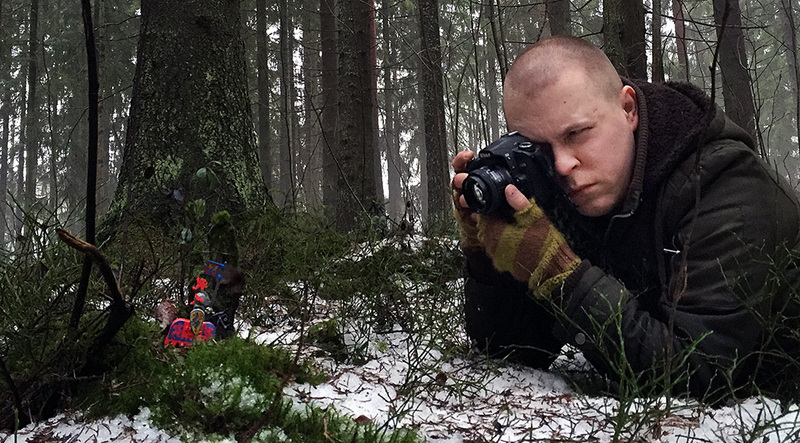 When he goes into a forest for a photo shoot, he takes something really surprising with him: Lego. Lauri puts a lot of thought into every single shot. His photos tell a coherent story. You see, not only is Lauri a photographer, he’s also a storyteller. 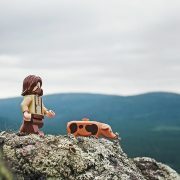 It was Lauri’s son who first inspired him to tell a story by photographing Legos in the wilderness. Nowadays we can all admire his work on Instagram. The first story Lauri wrote was called The Tale of Three Crystals. 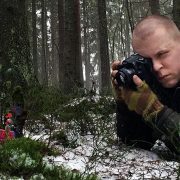 To learn more about these breathtaking Lego adventures in the Finnish nature, check out Lauri’s Facebook page Tales of the Woodland Realm. 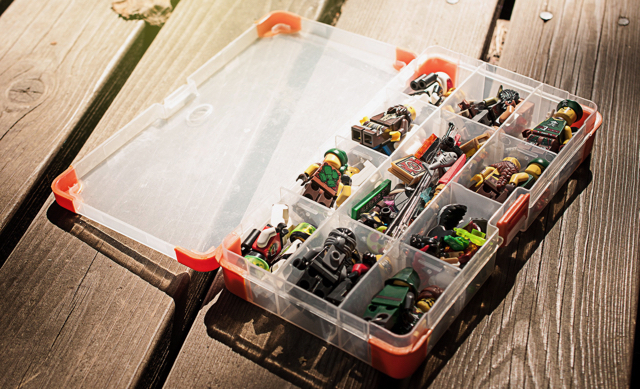 Read here what Lauri tells about his Lego photography! 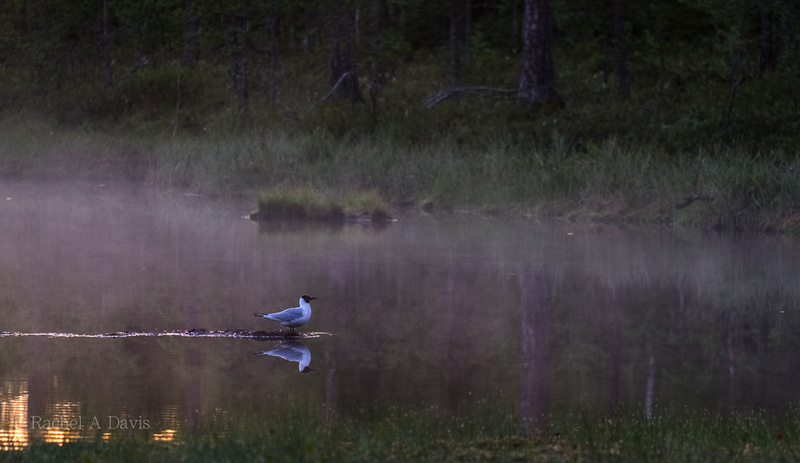 https://finlandnaturally.com/wp-content/uploads/2016/11/takingshots.jpg 569 1028 Jonna Saari https://finlandnaturally.com/wp-content/uploads/2016/08/finlandnaturally-logo.png Jonna Saari2016-12-10 14:25:362017-10-27 08:41:36This man took some Lego into a forest – see what happened next! 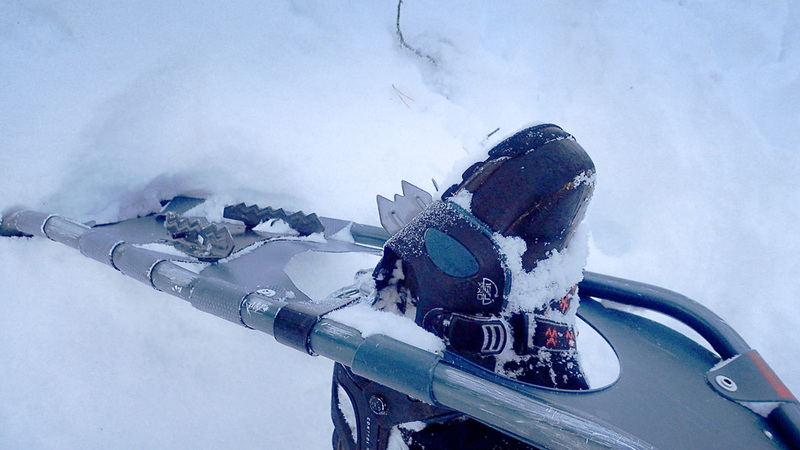 Hiking up fells with snowshoes is fun and good workout. 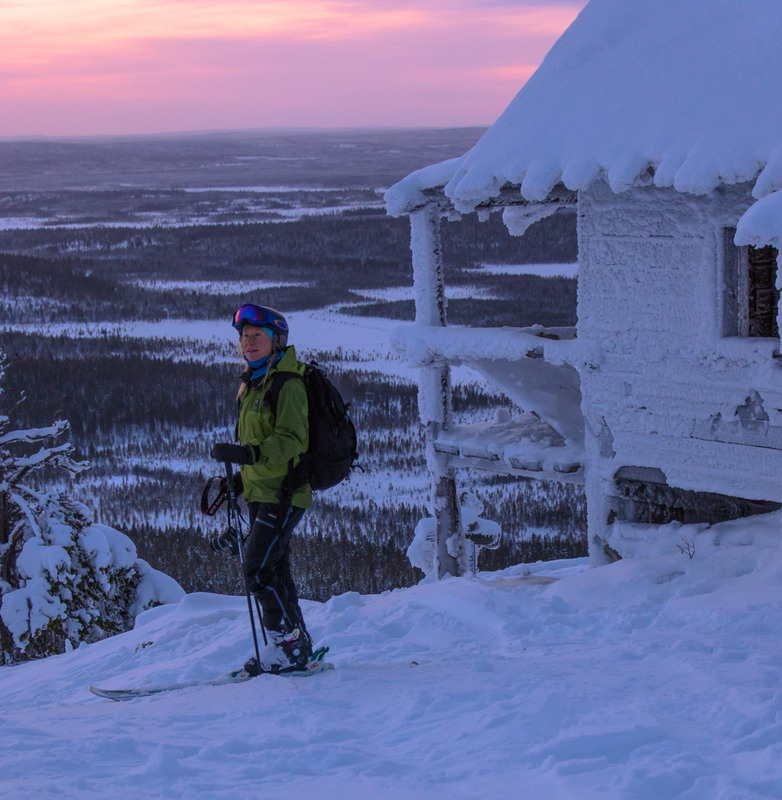 Ylläs has around 50 km of marked snowshoeing routes to keep everybody happy and fit. 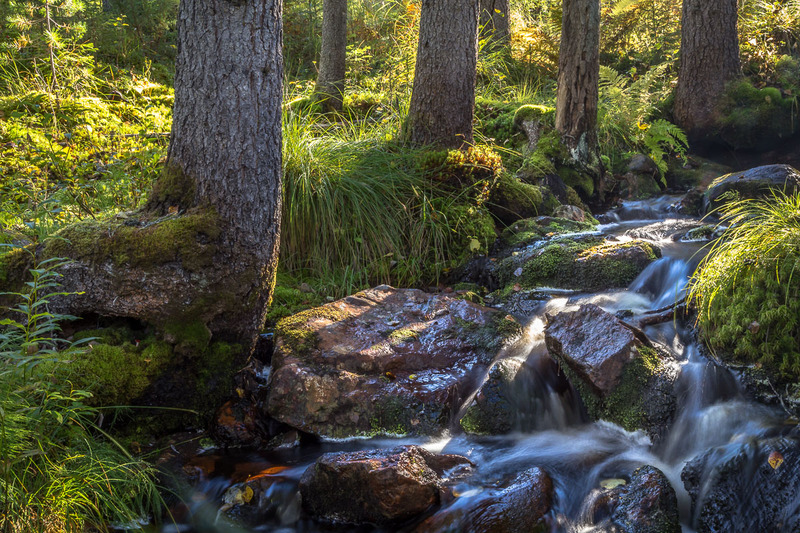 You don’t need prior experience, just good spirit and a camera to capture the breathtaking nature around you. 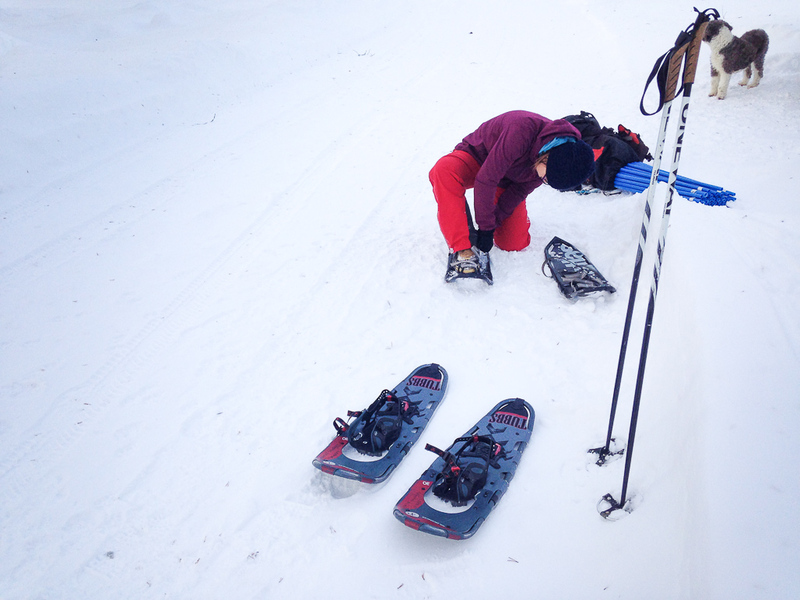 My first encounter with snowshoes was sweaty but left me infatuated. Tuija attaching boot to the binding. It is around -10 degrees of Celsius and we are feeling a bit chilly as we should. It’s going to get sweaty! My choice: Merino wool base layer, T-shirt and a windproof softshell. 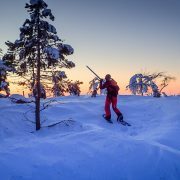 In the early December days I tagged along a friend who had a task of marking a snowshoeing route next to Ylläs fell in Lapland. 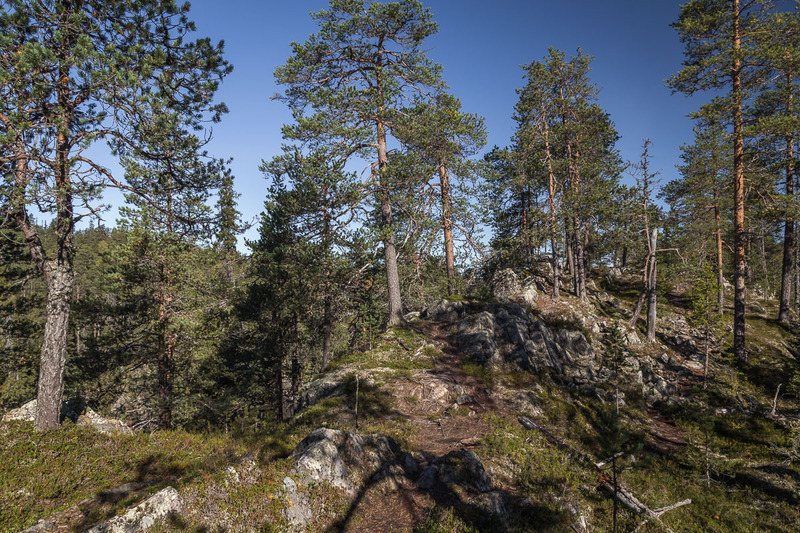 The route is 3–4 km in length and takes you up through a magical forest on top of a small fell “Pikkulaki” for some striking views and back. We stuffed a big bunch of blue poles in our hiking backs and started the journey. 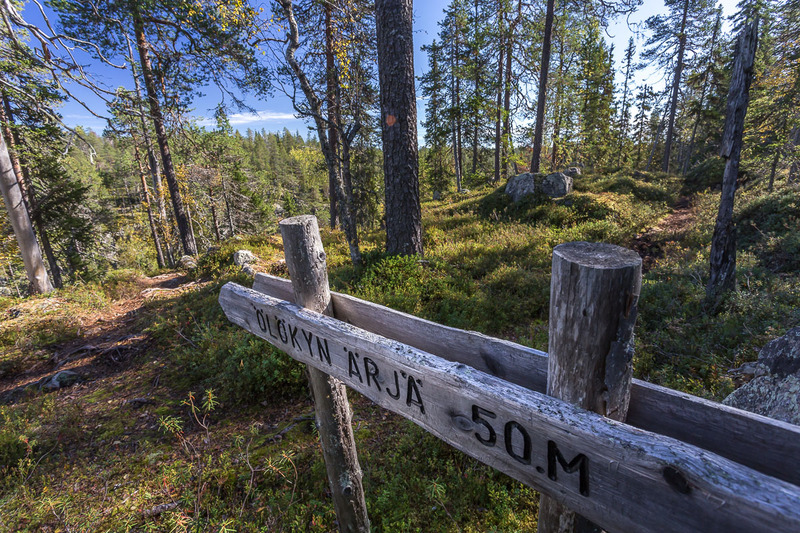 Tuija needed to mark the path to follow specific route, so that it follows the same route as on official maps. Tuija marking the official route with blue poles. Elli the dog is helping. 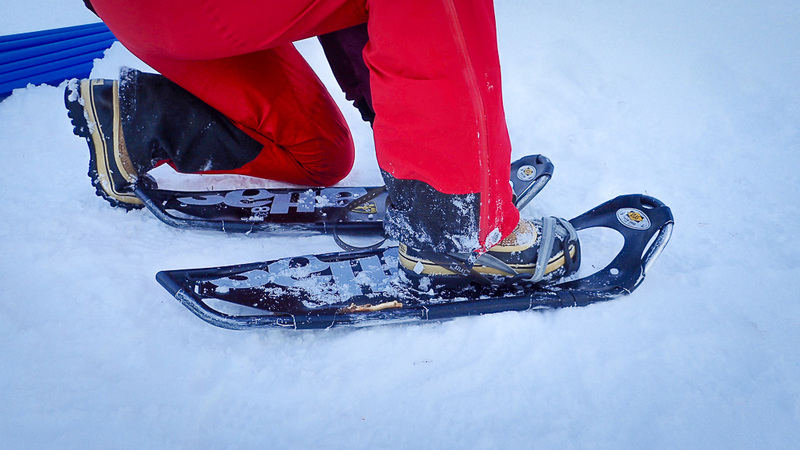 There are many different kinds of snowshoes but they all work with the same idea: You place your shoe in the binding so that your toes point to the shorter end of the snowshoe. Tighten the cords and go! 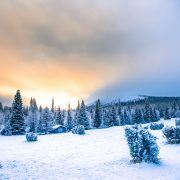 The point of snowshoe is that it is easier to walk on top of loose deep snow when your weight is distributed on larger area the your feet. The larger the area, the more it allows you to float on top of snow. The same applies with skis: the longer your skis, the better they will hold you on top of snow. 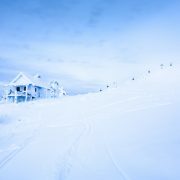 This effect was the reason skis and snowshoes were invented in the first place – to help people move in deep snow. So we embarked upon our journey and within 50 meters it was clear it is going to be rough. Even the dog Elli knew it and wisely saved her energy by stepping only our tracks. 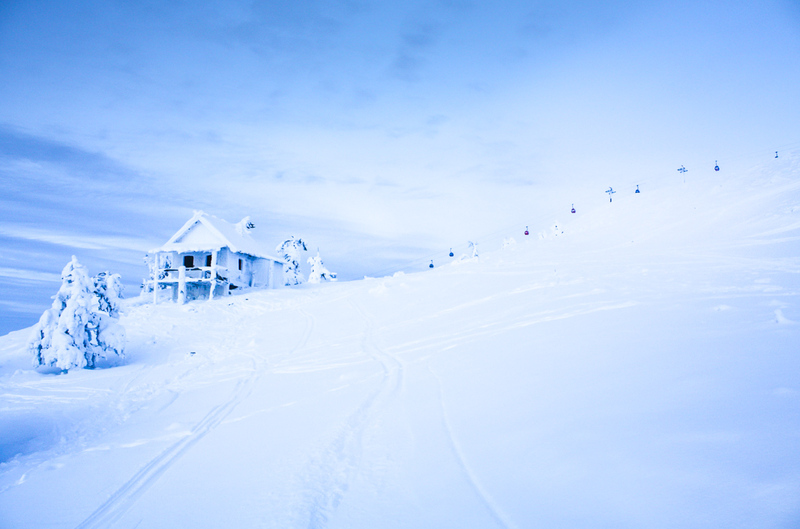 The snow was powdery but packed tightly by wind and there was a lot of it, 40–50 cm on average, sometimes much more. So the snowshoe didn’t really do the magic and let me glide on snow as I was expecting, but rather I had to work really hard in knee deep snow to take steps forward. But Tuija was reassuring that conditions on this particular day were harder than usual. Onward we went. The first hill was very small but steep. I felt I was sliding back and couldn’t get a grip. Then Tuija pointed out there are metal “teeth” below the shoe that allow you to step on you toes and get a proper hold of snow when climbing a steep surface. So I changed my step to tiptoeing, with success. Forest is just magical now. Trees have piles of snow on them, some of them are bend as the snow is so heavy. The scenery is from a fairy tale, and as the day light gets fainter and fainter I start to see all kinds of mystical creatures in the tree silhouettes. Finally on the top, just in time to see the last beautiful rays of light! On the way back headlamps were needed. It took us a couple of hours to reach the top, Pikkulaki. It was 2 pm, the sun had only been up for two hours and had already set. 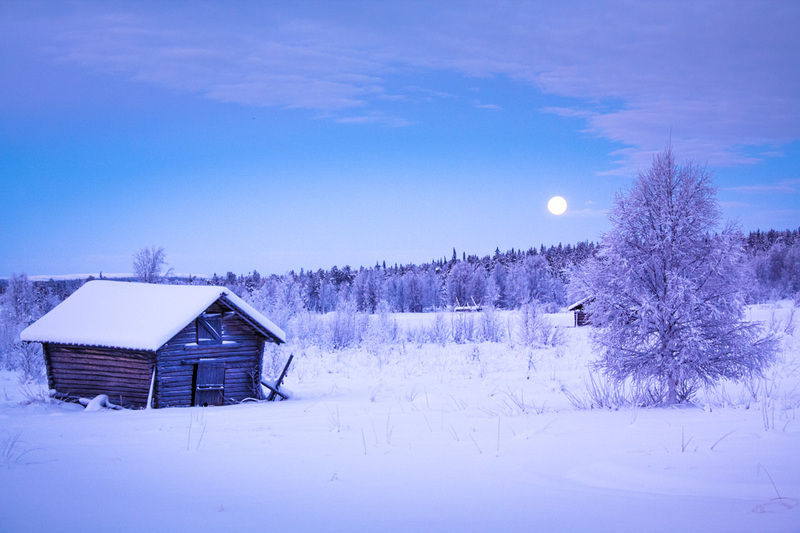 Polar night will begin here soon. The colours were breathtaking. View from Pikkulaki mini fell. Sweating up was totally worth it. I haven’t enhanced a single colour on this pic. 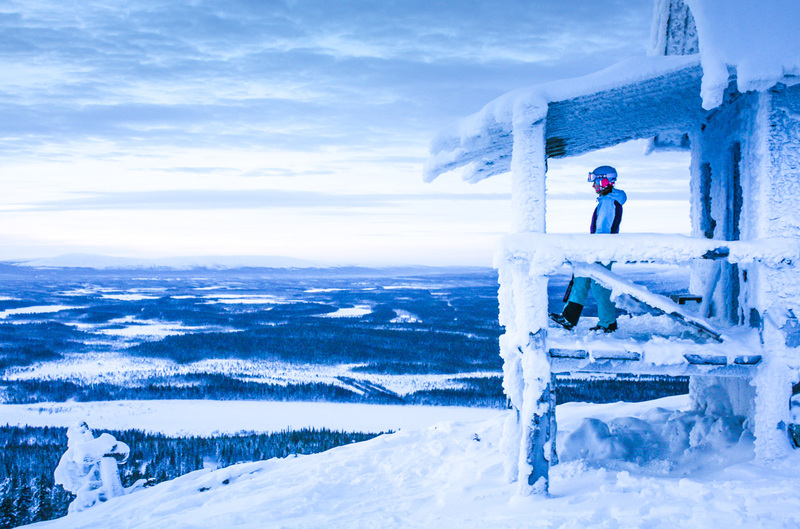 On the other side of Pikkulaki there is the grand Ylläs fell, boasting the largest skiing resort in Finland. Snowshoeing down was an easy ride as now we could follow our own tracks. On the way down we made sure there are enough of blue poles, so you won’t be puzzled or have to worry about getting lost. A map is a good friend though, so you see how to get to the starting point by car or bus. Tuija had her Sorel Caribous, I had my hiking boots plus gaiters to prevent snow from wetting my pants. Hiking boots or the like work as they feel comfy but robust, and they are somewhat waterproof. The rental places often have a variety of shoes if you don’t own suitable ones. 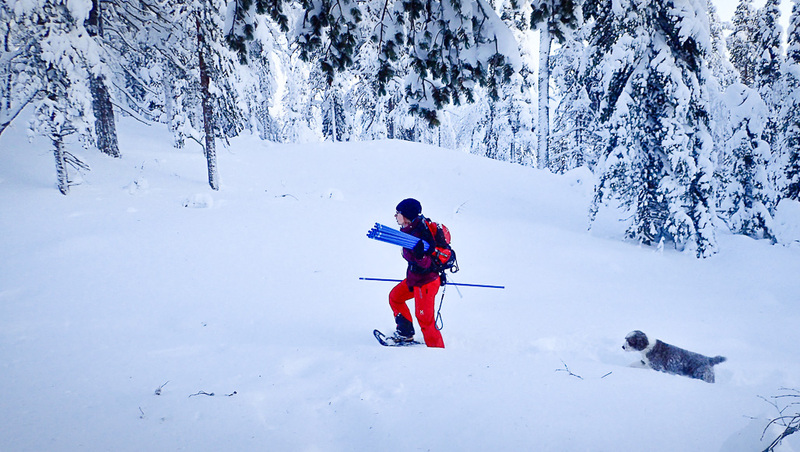 Snowshoeing is proper workout, make no mistake. Don’t overdress or you’ll be sweating like a pig. Well, I was anyways. But it’s important to have extra clothing in a backpack so you can add a woollen layer or two if you get cold during a break or when descending. A good advice is that you should feel slightly cold at the start. Your body will soon heat you up.